The Snowflake Valley was discovered somewhat accidentally by settler James Stinson. 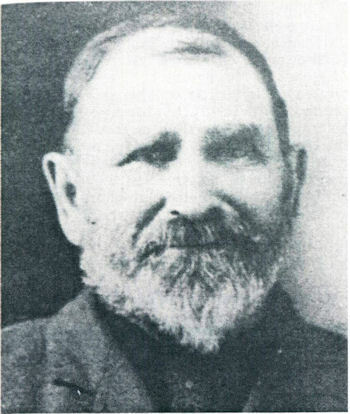 Stinson was contracted to take a delivery of cattle from Mexico to Army posts in northern Arizona and New Mexico. 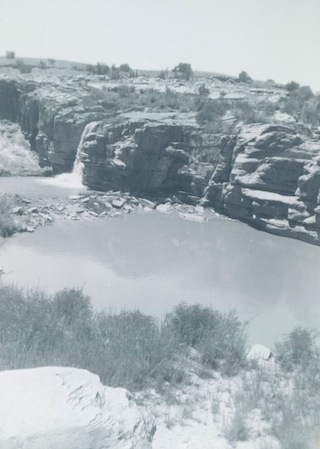 He was a resident of Colorado and traveled from the Four Corners area through what is now the Navajo Nation to the Little Colorado River near present day Winslow. While following the Little Colorado, he is believed to have mistakenly followed Silver Creek and camped in what is now the Snowflake valley. He had to backtrack to find the cattle rendezvous point and finish the delivery. He was so impress with Snowflake Valley that he later established a ranch there in 1873 with his partners, Dan Ming and a man named Evans. He began raising cattle and selling them to the Army at Camp Apache, later known as Fort Apache. 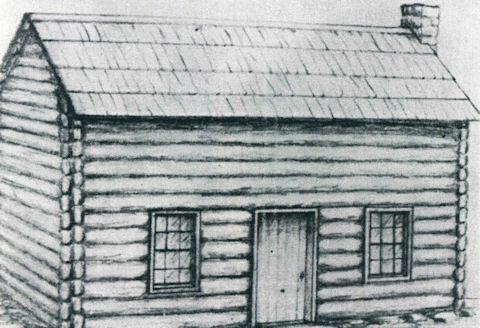 This log cabin was the first to be built in what would later become Snowflake. It was erected by Alma Z. Palmer (William Flake's brother-in-law) in 1878. It was on the corner of Miller and Freeman. 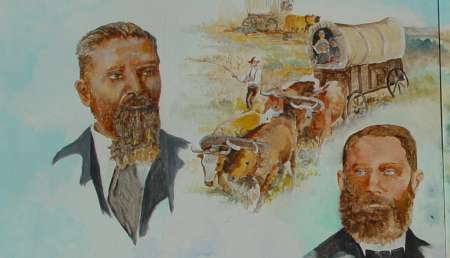 William J. Flake (right) was asked by Brigham Young, president of the Mormon church, to sell everything he owned and move his family south to help settle Arizona. He and his family first settled with other families in a place called Old Taylor in January of 1878. 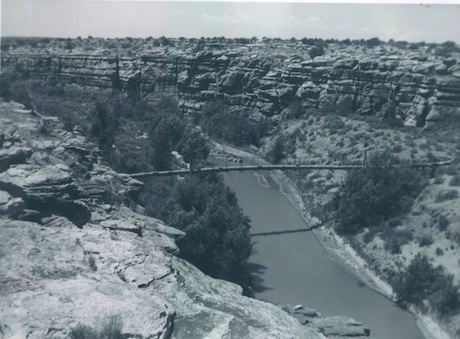 By June of that same year, dissatisfied with the hard conditions, Flake rode with his brother-in-law, Alma Z. Palmer, to Savoia, New Mexico, and St. Johns, Camp Apache, then back through Show Low and Silver Creek. They found that all the good land was already taken. The only place that was appealing to them was Stinson Ranch on Silver Creek. After negotiating on a price, Stinson agreed to sell his ranch to the Mormon settler. 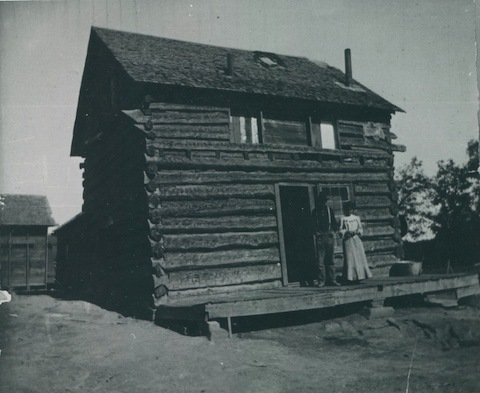 On July 19, 1878, Flake and his family began the trek to their new ranch and arrived two days later. 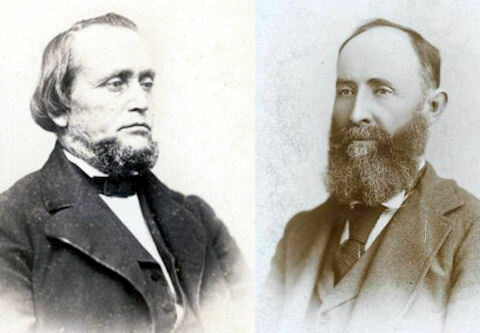 Erastus Snow (left), a Mormon apostle from Utah, after visiting the newly formed community in September of 1878, named the town Snow Flake after himself and William Flake. He gave instructions that the town should be laid out with 20 blocks consisting of four lots each. Each lot was to be 12 rods square (198 feet on each side). Streets were to be six rods wide running East and West, North and South. 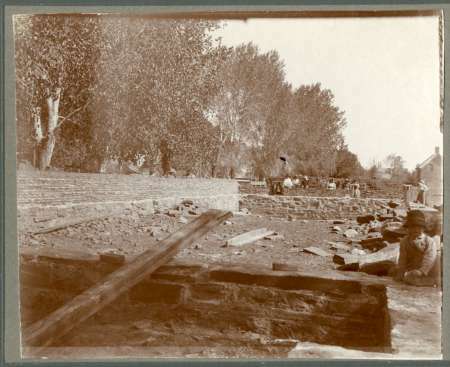 In the spring of 1884, when Snowflake was only six years old, the only brick building in the community was the LDS church which can be seen just to the right of center in this picture and in the inset. 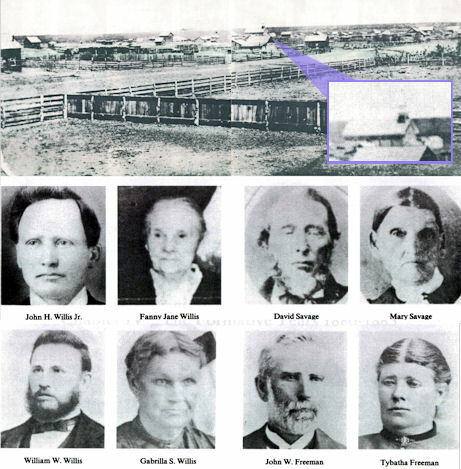 Some early settlers were, from top left, John H. Willis Jr., Fanny Jane Willis, David Savage, Mary Savage, William W. Willis, Gabrilla S. Willis, John W. Freeman, and Tybatha Freeman. 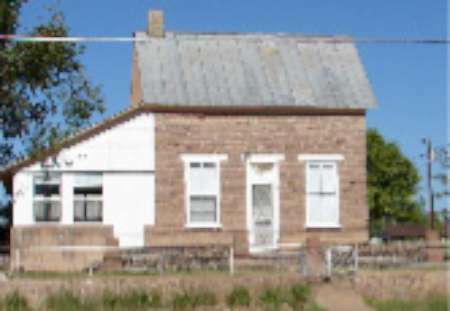 Top: This adobe home is the oldest building in Snowflake. 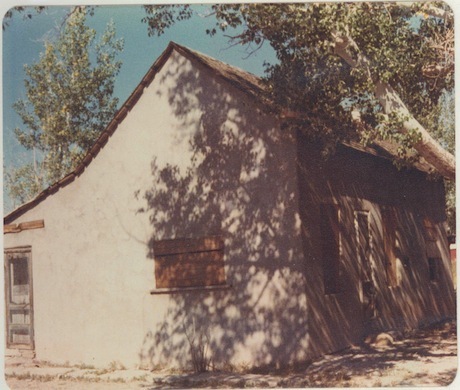 It was built by James Stinton and was owned by William J. Flake when he purchased the ranch.It was also used as a meeting house and a courthouse. This house and the adjacent building are now part of the Stinson Museum on 1st East Street. 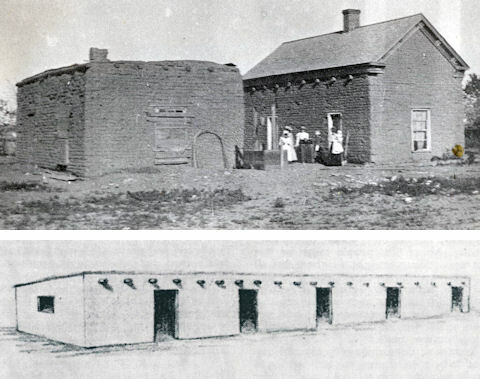 Bottom: Fifty yards west of the Stinson residence was this adobe house. It served many functions. 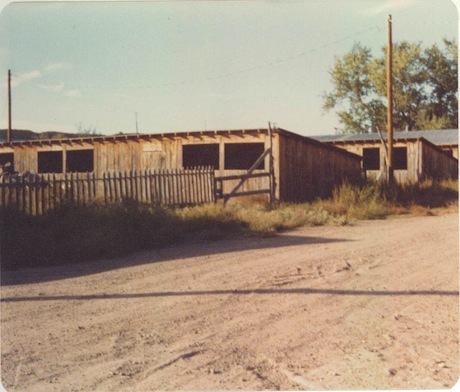 From the left, the rooms were used as the Stinson's first home, a room for hired hands, the granary, the tack room, and the last room was for machinery. 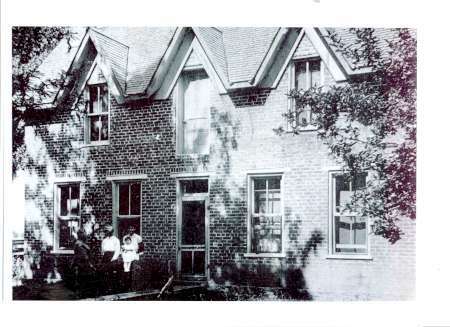 The first room on the left also later served as the first school in the valley. In 1879 this log cabin was built and used for public meetings, dances, church, and school. It was located at Hunt and Main Streets. It was 22 x 33 feet and was covered with shakes and clapboards. The Flake Brothers Store was started by Charles L. and James M. Flake in 1886 in Charles' log home. They had the contract to carry the U.S. Mail from Holbrook to Fort Apache. This brick building was completed in 1893 with the Flake Brothers Store occupying the ground floor. The second floor was used for dances and theatrical events. Charles was killed in December of 1892 before the building was complete. His brother James continued running the store and shared profits with Charles' widow Belle. When the Academy building burned in 1910, the upper floor was used for school classes. 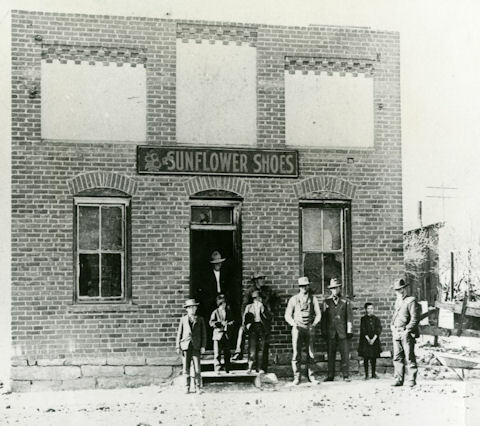 The Flake Brothers Store was destroyed by fire in January of 1912. Apparently the fire started during a woodworking class on the second floor. The Willis Brothers Store started in 1895 and was in business until 1921. This building stood on Main Street where the Circle K now stands. The Grill Cafe stood on the same site before the Circle K was built. 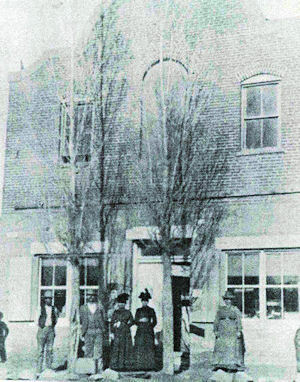 The original Snowflake Stake Academy building pictured here was completed in 1901. 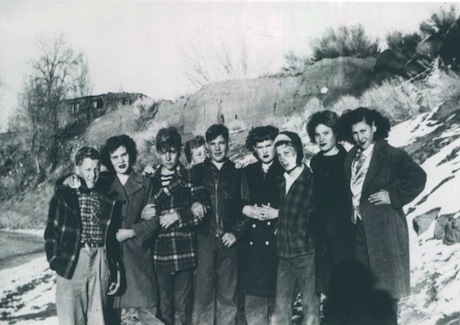 The Stake Academy was a Church of Jesus Christ of Latter-Day Saints educational institution. It burned down in 1910. 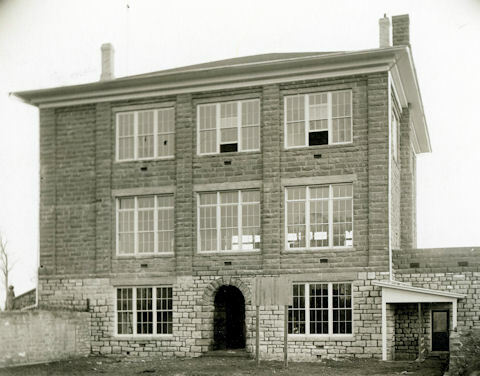 A new Stake Academy building was built in 1913 and still stands next to the current High School. 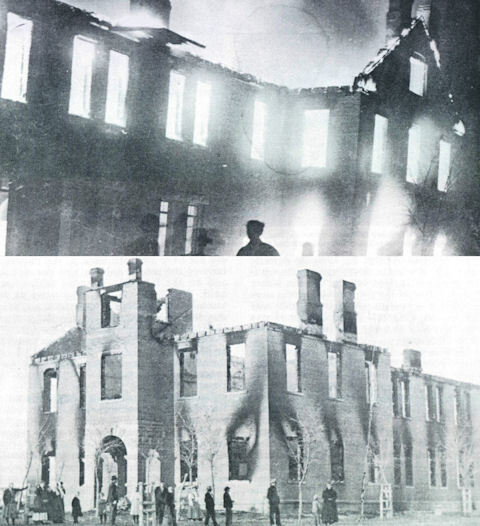 The Stake Academy building was completely destroyed by fire on the night of November 24, 1910. Classes were then held in the upper floor of the Flake Brothers Store until that too was destroyed by fire 14 months later. 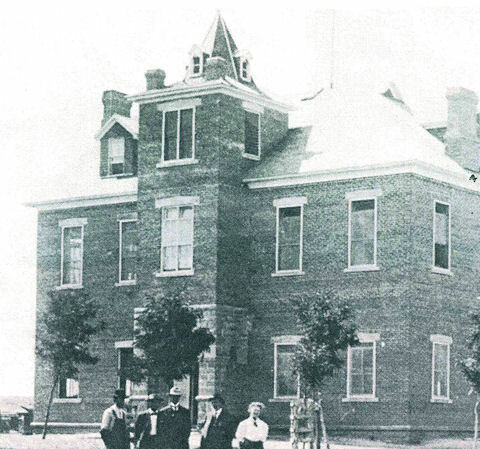 When the 1901 Stake Academy building burned after less than 10 years of use, a new Academy was constructed using red sandstone quarried between Snowflake and Taylor. 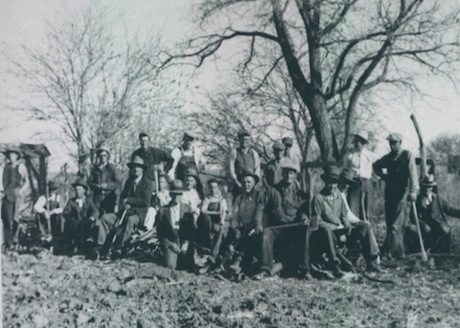 This photo was taken during the construction of the new Stake Academy building which was completed in 1913. This view is of the north side of the structure. The building faces east. This Snowflake Stake Academy building was built in 1913 after the original building was destroyed by fire in 1910. It was used for high school classes and the school library. As of 2012, the Academy building is undergoing renovations to eventually become the new home of the Snowflake-Taylor Public Library. 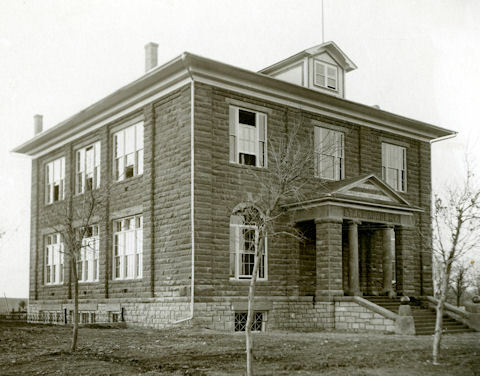 The north side of the 1913 Stake Academy. 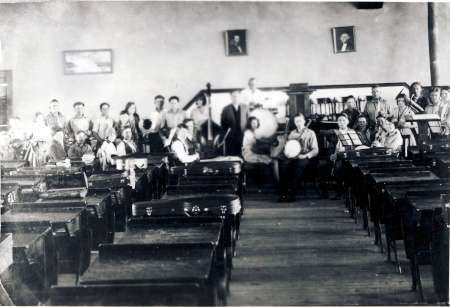 The Assembly Room in the Stake Academy building. Construction of the Social Hall began in 1907 and the construction was completed in 1909. 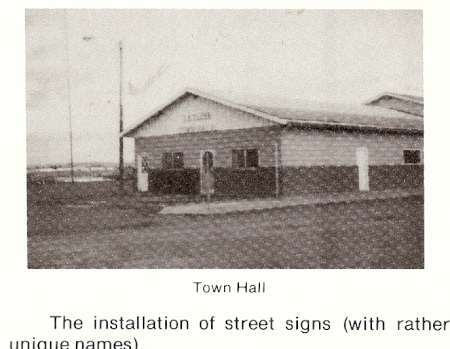 This Social Hall was built in 1909. It was used for dances and theatrical presentations. 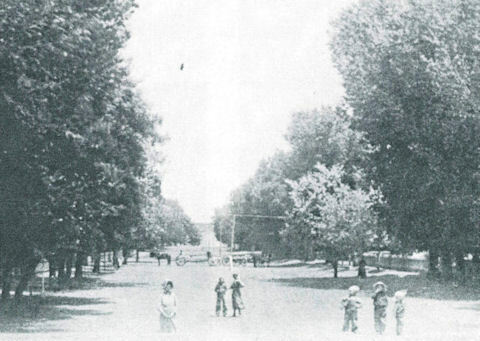 This is a view looking north on Academy Street (now 2nd Street West) in 1909. 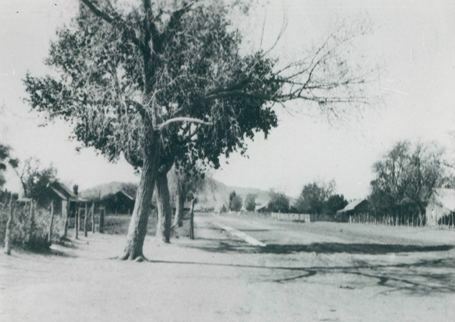 The trees in the photo were cottonwoods and ditches ran along both sides of the street. 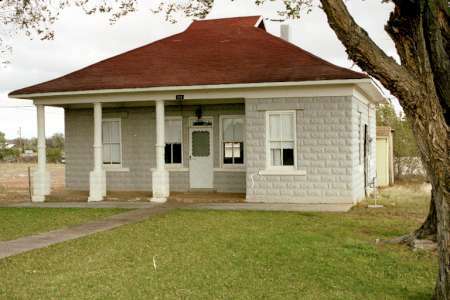 Built in 1891, the old District School is now used as the Snowflake Town Hall. 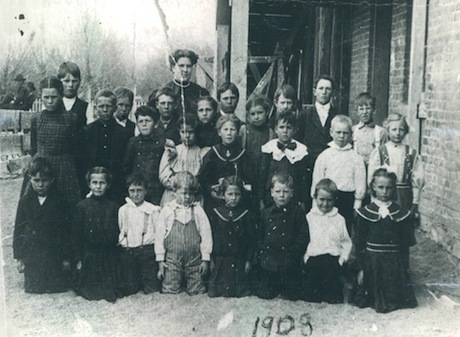 This school photo was taken in 1908. The teacher in the picture is Leonora Smith Rogers. Ike Rogers is on the horse. 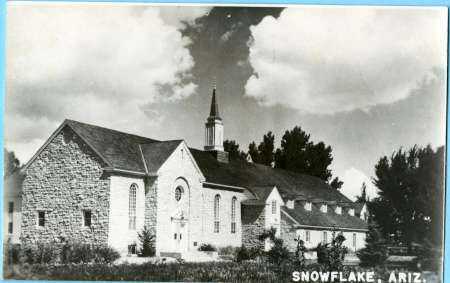 In the late 1940s the town of Snowflake purchased the old District School and renovated it for use as the Town Hall. 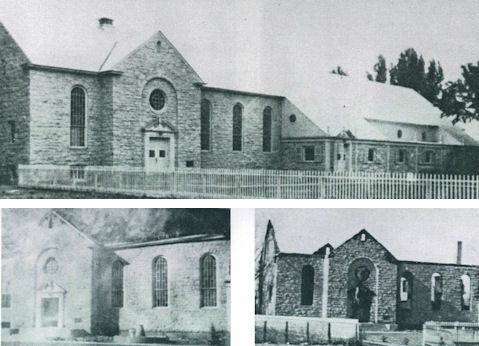 The upper photo was taken in 1964; the lower photo was taken in 1976 or 1977 after remodeling in anticipation of the community's upcoming centennial. This view of the Highland Park area shows 14 years of growth from 1963 (top) to 1977 (bottom). This area's construction began about the same time as the Paper Mill began construction. The Stake House in downtown Snowflake was built in 1939. It was destroyed by fire just two short years later in 1941. The church building that currently stands on this site was constructed using some of the surviving walls. 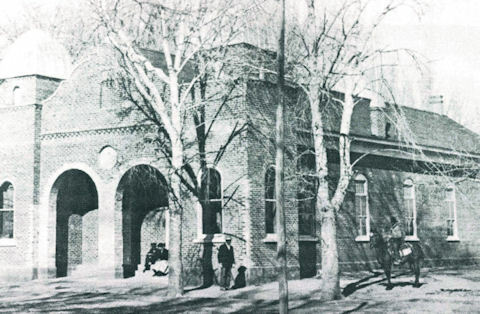 This building, the downtown LDS church, was rebuilt over the remains of the 1939 Stake House that burned in 1941. This latest version was completed in 1943 and used sandstone from a quarry northwest of Snowflake. Logging was one of Navajo County's biggest industries. Inter-community boxing matches were held in Taylor and surrounding towns. These drew quite a crowd and gave men something to talk about when they got together. 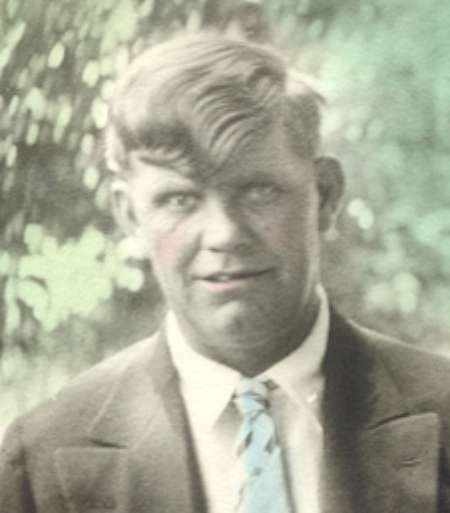 Originally E. W. Farrar, a 5 foot 2 inch 115 pound man started wrestling classes and instigating matches in 1914. No one in the community could beat him. William W. Willis built a room for a social club and athletics. The Snowflake Amateur Athletic Club was started. In 1932 they reorganized to the Snowflake Athletic Club featuring boxing. The clubs manager was 'Doc' Gilbert M. Webb and they held the first exhibit in September. Boxing continued to be one of the best attended sporting events for many years. 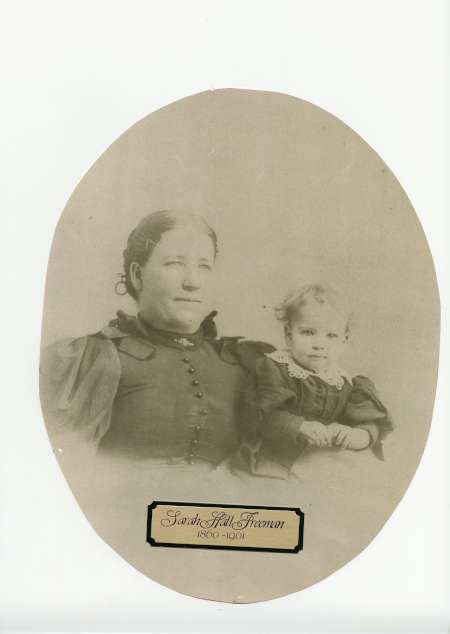 Born in Utah in 1860, Sarah Hall Freeman and her husband John Albert Freeman later moved to Snowflake. They had nine children. She died in 1901. 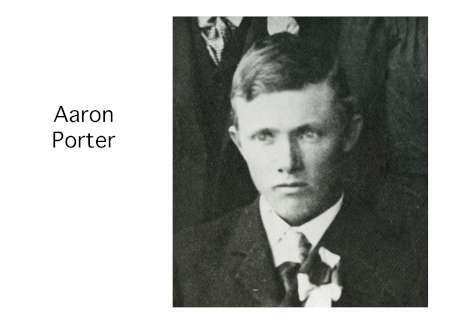 Aaron Porter Adair was born in Utah in 1850 and later moved to Snowflake. He died in 1900 and is buried in Show Low Cemetary. His wife, Fanny Crosby Adair, outlived him by 15 years. They had one son, Aport Adair. Lowell Barr Turley was on born April 21, 1892. He married Grace Freeman. 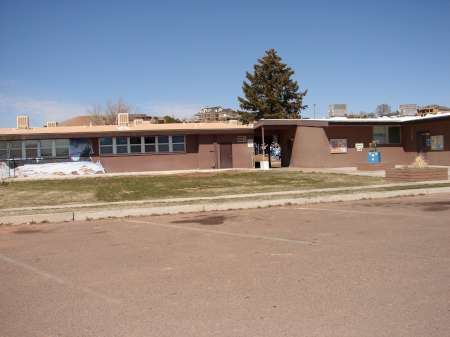 They raised several children, and several of their descendants still reside in Navajo County. 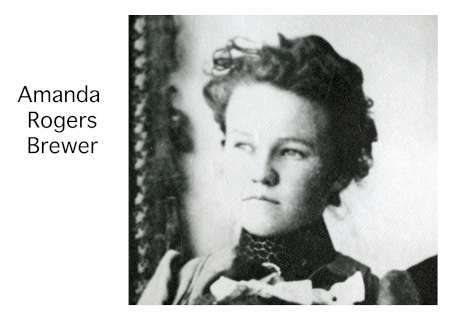 Amanda Rogers was born in Snowflake in 1884. Her parents were Smith Doolittle Rogers (1852 - 1909) and Eliza Snow Smith Rogers (1859 - 1927). She married Jacob Edward Brewer. She died in 1965 and is buried in the Clay Springs Cemetary. 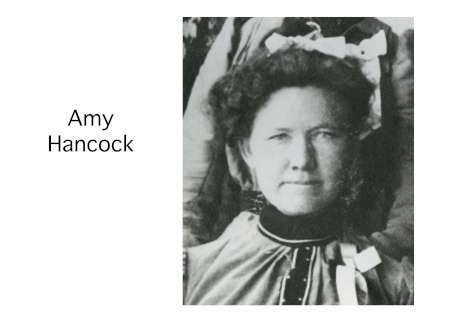 Amy Elizabeth Hancock was born in Leeds, Utah in 1873 to Mosiah Lyman Hancock and Margaret McCleve. She was the 10th of 13 children. She married Samuel William Baird. She passed away in 1956 in Clay Springs. 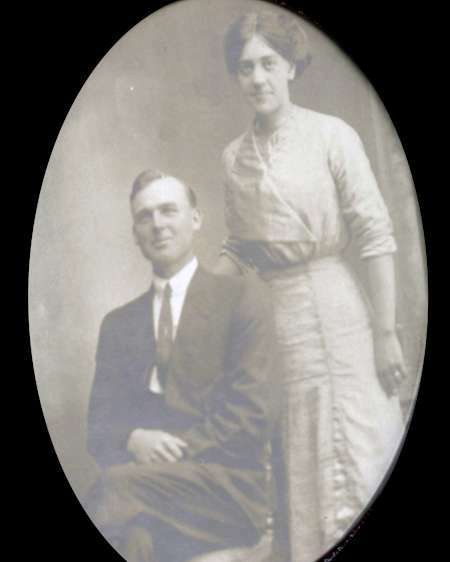 Her father, Mosiah Lyman Hancock, was from Ohio and her mother from Ireland. They were early Mormon settlers, traveling through Nauvoo and later settling in Utah. Later they continued on to Arizona as part of a colonizing mission. At the time polygamy was a common practice for Mormons, and Mosiah may have had four wives. 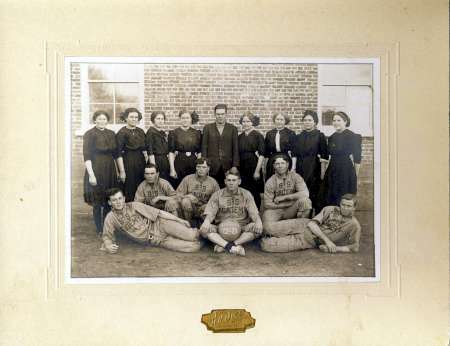 The Snowflake co-ed basketball team in 1912. 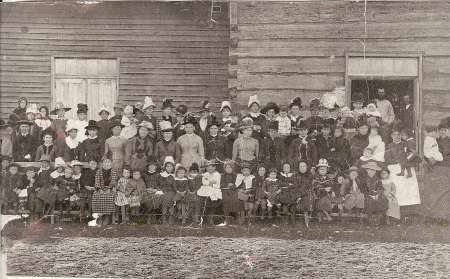 A group of friends gathered in Snowflake in 1911. The class of 1910 with their diplomas. 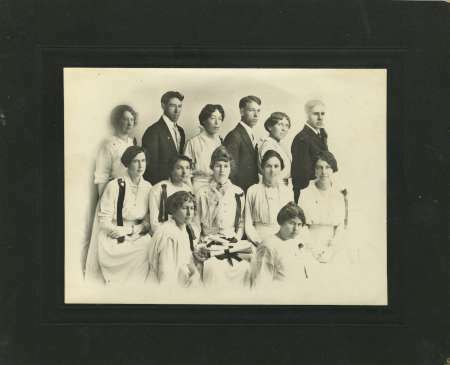 The class of 1915 poses with their diplomas. The Womens Relief Society was born from a need for healthcare for women. The LDS Church designated women to serve as midwives assisting with prenatal education and childbirth. 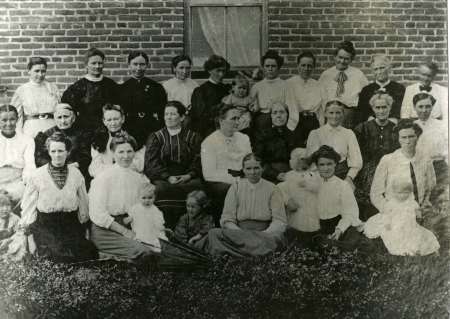 Ward Relief Societies established health programs in the late 1860s when Brigham Young had two of his wives start healthcare education classes and train midwives, eventually opening a nursing school for training. Snowflake had their own maternity hospital set up by the Ward Relief Society. Relief Society members joined voluntarily out of a desire to serve. Services they provided included sewing clothing and quilts, cooking classes, community beautification projects and making sure the needy were cared for. Just 10 miles northwest of Snowflake are many karst formations in the form of sinkholes. These are caused by underground erosion. Because of its great accoustic properties, one of these sinkholes was used by the senior high school classes for theatrical productions between 1933 and 1940. In this photo the class of 1938 is presenting "The Faerie Queene." 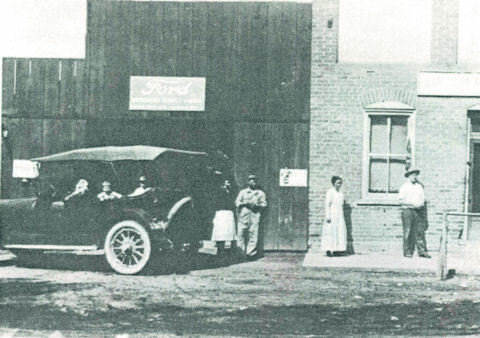 Ford Garage was next to the Willis Brothers Store on the south side. It was known as the Southside Garage. Later it was called the Ballard Brothers Garage. By 1914 the use of automobiles in Snowflake had increased so greatly that ACMI installed a gas pump at their store. 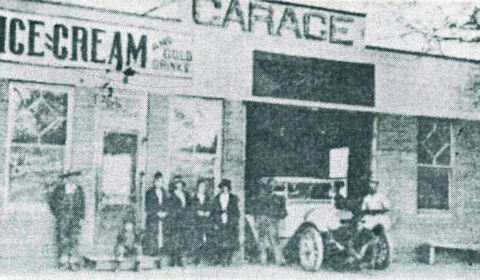 McLaws Garage, which opened in 1912, started offering gas soon after. Also pictured here is Updike's Ice Cream Parlor, which was located next to McLaw's. Taylor’s first two settlers were James Pearce and John Henry Standifird in 1878. This painting by Peggy Rogers depicts the settlers traveling by wagon. 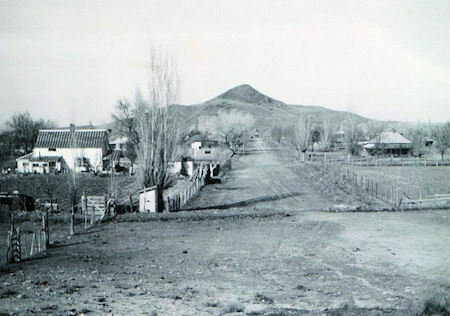 Pearce started for Arizona on October 18, 1877, coming by way of Lee's Ferry to Moincopi, through Tucker's Flat into the settlements of Sunset and Brigham City. They arriving in Woodruff on December 13, 1877. He left his family there while he explored the country to the South. Then on January 21, 1878, he decided to retrieve his family. They left Woodruff on January 22, headed toward Silver Creek. Mary Jane, his wife, was lying in the back of the wagon suffering from a headache. Coming over the hill in view of Stinsen Ranch (now Snowflake) James said, "Now come and look at this, all this valley belongs to James Stinson." She replied, "Well this is too good a place for one man to have. It won't be more than two years before our people will have this place." Quoting James Pearce, "This was nearly six months before the Flake Party located at Snowflake". 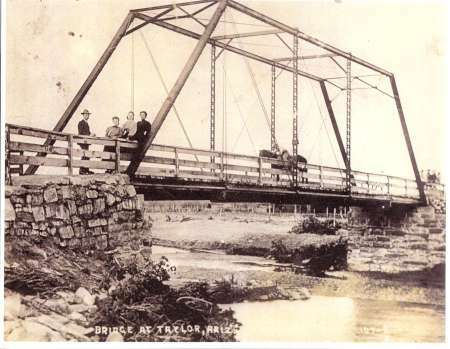 On January23, 1878 they arrived at the present site of the town of Taylor. "This land was not surveyed and I (James Pearce) simply had a squatters claim. John Henry Standiford, with his thirteen year old daughter, Ann, came to Pearce's place March 7, 1878. They stayed with the Pearce family and the two men decided to join forces. If they were to survive the winter a crop had to be raised that year. They explored up the creek and found a place where irrigation water could be put on the land quickly and easily. For two milk cows they purchased the Squatter's Right to this place from Felix Scott. It is known today as the Bert Solomon Ranch. The remains of their old dam and ditch are still plainly visible. 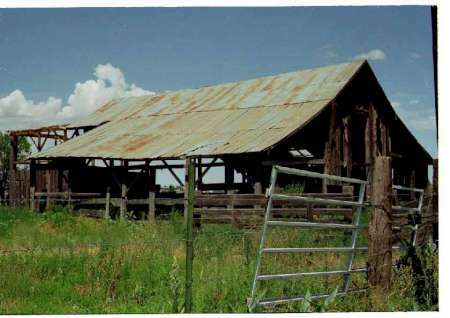 They raised a good crop in 1878, which sustained them and also helped sustain settlers in Snowflake valley. 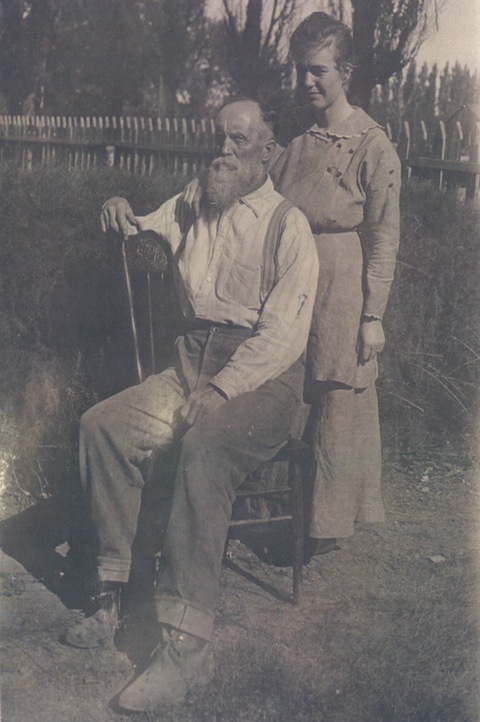 In July 1878, John Henry Standifird returned to Utah for his families, leaving Ann with Mary Jane Pearce. This place was farmed during the summers of '78 and '79, but the winters were spent in Taylor helping with the survey and lay out of the town. 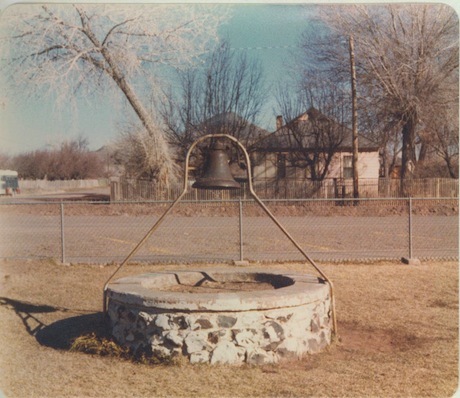 Photo provided by the Taylor/Shumway Heritage Foundation, in Taylor, Arizona. 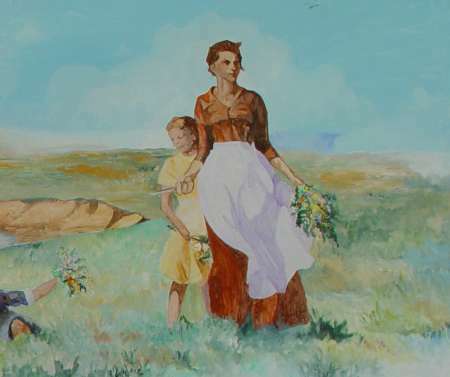 This is a painting depicting Mary Jane Pearce and a child on top of the hill above their dugout. Living underground had its challenges. Once, Mary Jane was laying in bed and saw a snake coming through the ceiling. She called for a knife and chopped off its head. 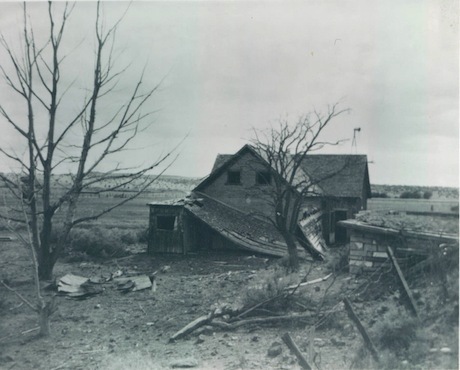 At one time 34 people used the dugout for their headquarters, living in wagons around it. 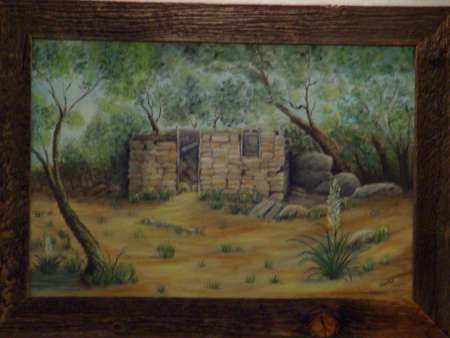 The painting is by Peggy Rogers. Jesse Pearce found a good place to stop about three miles south of Stinton's ranch. This was on January 23, 1878. He constructed a crude dugout in the side of a hill for his wife and children to live in temporarily. Dugout shelters were always considered temporary, but they provided good shelter while a permanent home could be constructed. It was located on a rise above Silver Creek, approximately one hundred yards south of modem-day Pinedale Road. They had crude furniture and wood beams across the ceiling to sustain the weight of the hill above. Each night they would move the table against the door to protect against any invasion. 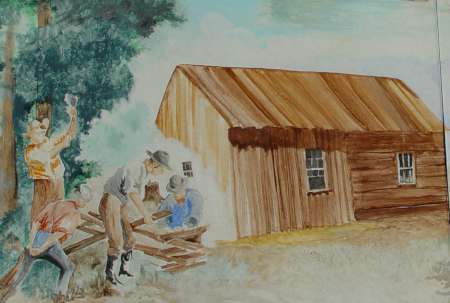 This is a painting by Peggy Rogers depicting early settlers building one of the first homes in Taylor. The lumber for building had to be hauled 20 miles by oxen or wagon. 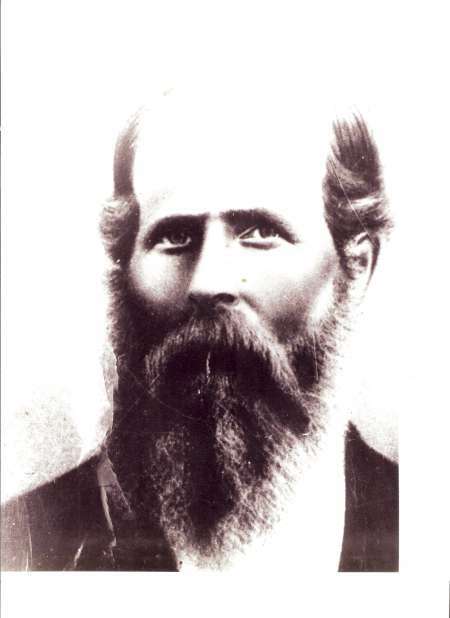 The original settlers of Taylor were members of the Church of Latter Day Saints. 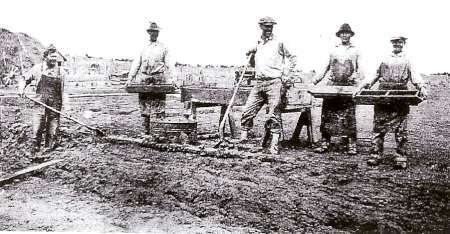 The Zion Plan for establishing settlements used by Brigham Young, the Latter Day Saints leader and western colonizer, included sending ahead the tradesmen necessary to establish a community. One of the trades deemed essential was a blacksmith. 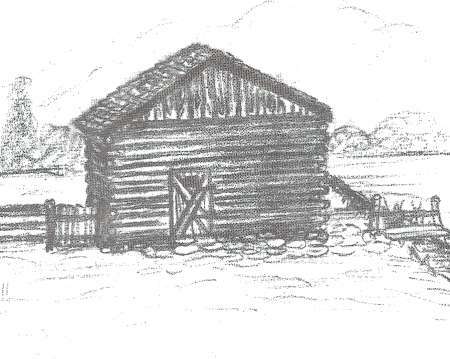 This is a drawing of Joseph Smith Hancock's first Blacksmith shop in Taylor. 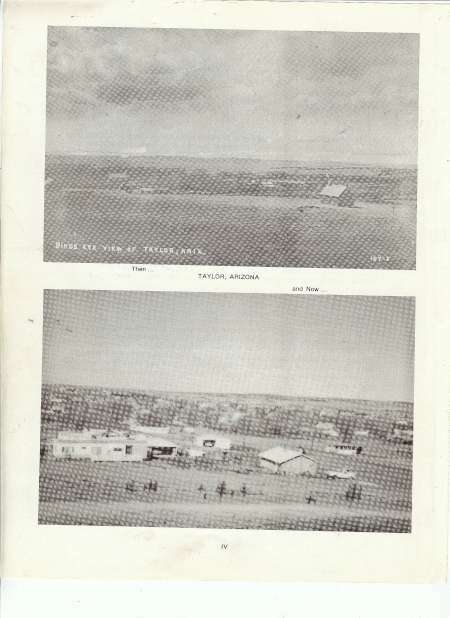 A birds-eye view of Taylor. One of the first necessities for the pioneers settling in Taylor was to dig ditches to get water to the land for planting crops. It was hard back breaking work, but the settlers had no choice but to accept it as a necessary part of creating a new settlement. Colonization was hard work, and horses were essential both for hauling heavy loads and for farming the new land. Men took excellent care of their teams, and took great pride in them. Plowing the fields was an exhausting job. 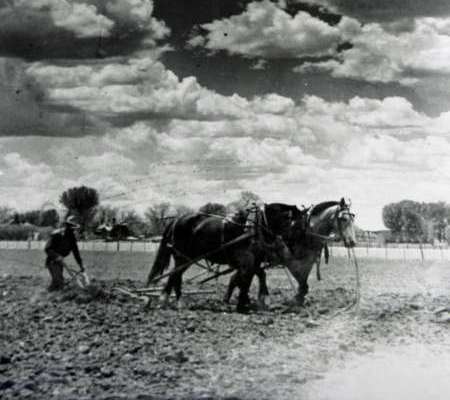 Horses were used to pull the plow, but a person still had to add pressure to keep the blades in the soil and guide the horses. The soil in Taylor is very dry and clay-like. Corn was one of the most popular crops for Taylor right from the beginning, and remains so to this day. On Labor Day weekend, Taylor sponsors the Corn Festival at the Rodeo Park where you can get delicious fresh roasted ears of corn on the cob and barbecue. Haying in Taylor was essential for survival. When the weather is warm, farm animals can graze in pastures, but pioneers had to grow enough hay in the summer to feed the livestock during the winter season. 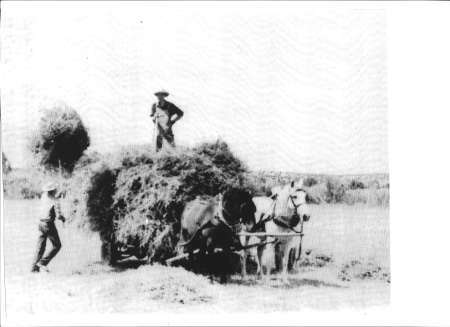 Unlike the modern hay baling process which uses machinery to create and transport bales, Taylor pioneers did it all by hand. Roundup time involved checking the calf crop, bringing in the strays, and getting ready to trade or sell the livestock. In most cases the entire family helped with this process. 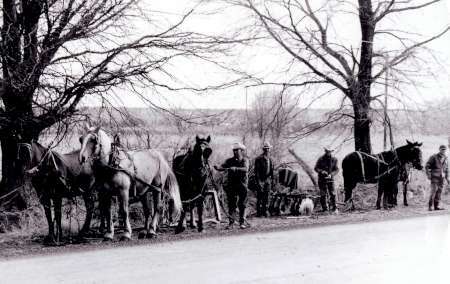 Ditch cleaners and their horses or mules cleaned the trash and weeds out of the ditches before they let the water run. All the local citizens looked forward to witnessing their expertise. Women crossing the plains in covered wagons during the nineteenth century didn't have access to doctors or standard medical treatments in the wild west. Midwives that either received training or learned through experience were used for to assist with child birthing. Often the midwives would stay with the new mothers up to two weeks after birth. 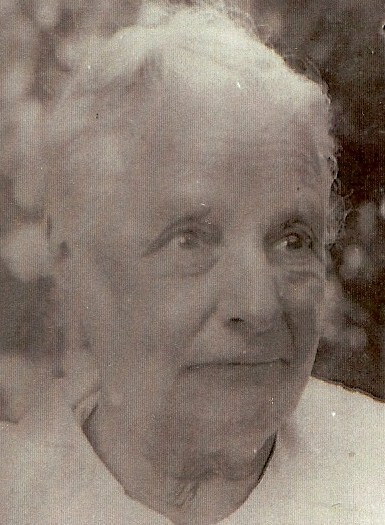 Margaret McCleve, born in 1838, came from Belfast, Ireland after her family joined the LDS Church in 1941. They arrived in New York by ship, then traveled by train to Winter Quarters, Nebraska. 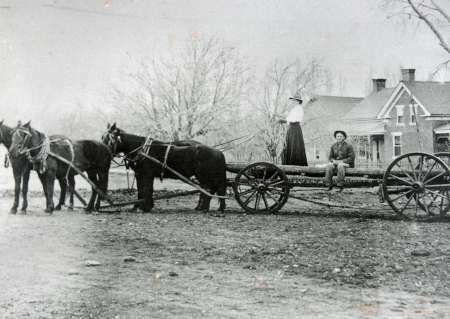 From there they pulled a handcart to Salt Lake City, Utah as part of the second handcart company. 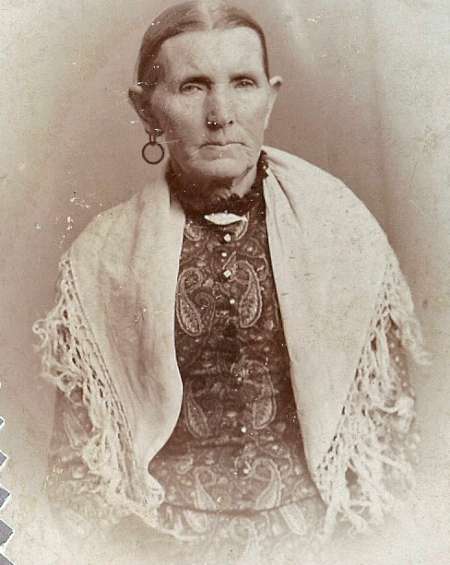 Margaret married Mosiah Lyman Hancock in 1859. Mosiah answered the call in 1879 to serve in Arizona, and the family went with him. Margaret worked as a midwife in the Taylor area, delivering over 1500 babies. She passed in 1908 and was buried in the Taylor Cemetery. Margaret Hancock McCleve's midwife trunk sits at the foot of the bed in their small cabin. Margaret and Mosiah raised 13 children here. 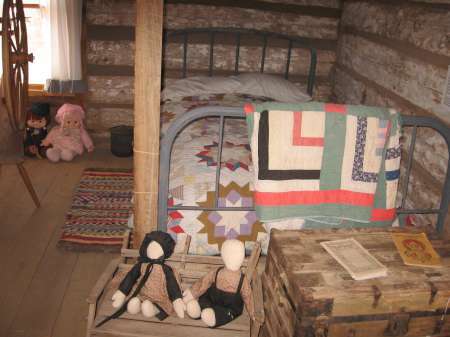 This cabin has been preserved and restored by the Taylor/Shumway Heritage Foundation. Pioneering women crossing the plains in the nineteenth century had no access to doctors or medical treatment. To fill this void, midwives were trained and certified to aid in child birthing and women's health needs as they settled in the wild west. Midwives would sometimes stay with new mothers for 2 weeks to help in her recovery and care of the family. 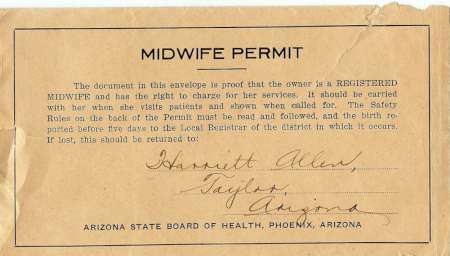 This Midwife Permit for Harriett Allen certifies that she was a registered midwife and was to follow all the safety rules within the permit. It was issued out of Phoenix, Arizona by the Board of Health. The permit had to be shown when called for births and had to be registered in the district within 5 days. Midwifes were a very important part of rural communities until doctors arrived in the area. Harriet Allen was one of many women that had to learn a profession when their husband's died in order to survive. She learned midwifery to earn enough to support herself and her children. Life in the West was difficult enough, but having to support your family without a husband in a patriarchal society was even more challenging. This is a 1910 Jenny plane that landed in the early days of Taylor. 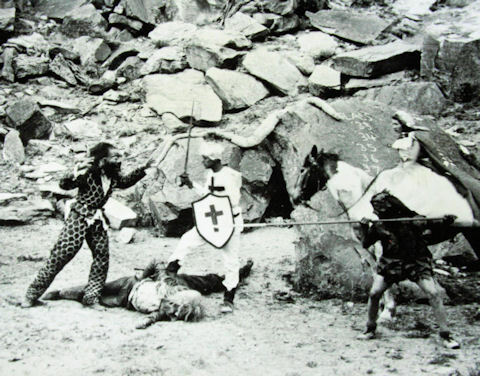 Quill Standifird is the second man from the right. 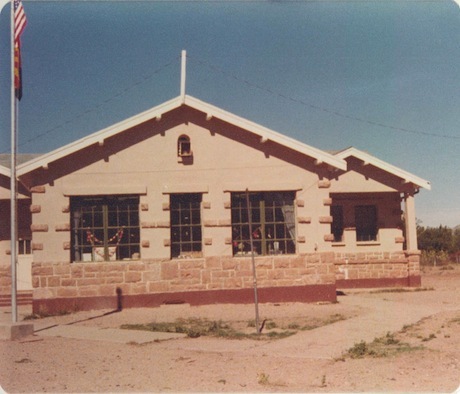 The Shumway Schoolhouse in Taylor is one of the only one-room brick schoolhouses in Arizona. It was created from locally fired soft red brick in 1900. There is a bell steeple in the front. 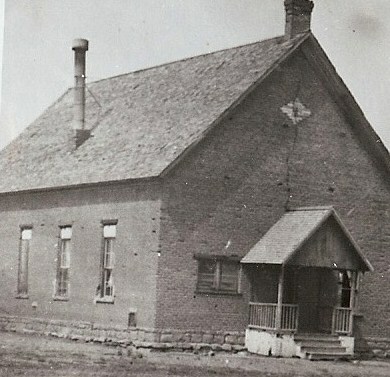 Prior to its construction there was a log meetinghouse being used for the school. The chief carpenter for the building was a Mr. Reynolds The masonry was done by George Gardener and his son Charles, of Snowflake. Neil Hansen of Lakeside did the plastering. It was restored in the 1990s. Two early photos taken of Taylor from Solomon Hill. 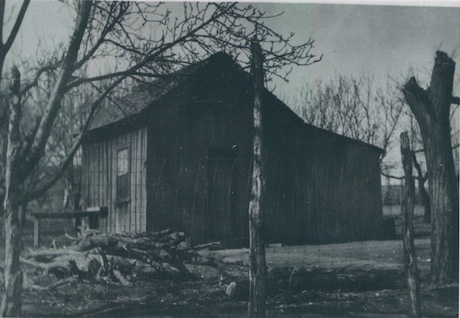 Taylor started out with a bowery and then built a log building to be used as the community center, church and school. In time they outgrew the old log school and a new addition was framed and sided with "clapboard" rather than made of logs. 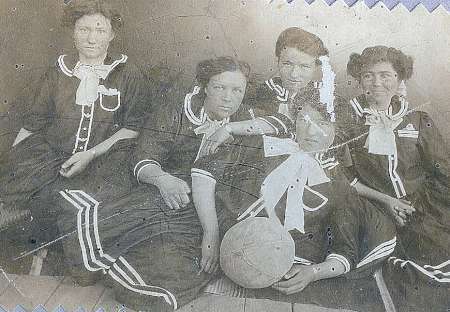 Ladies basketball was considered an acceptable sport in the early 1900's. 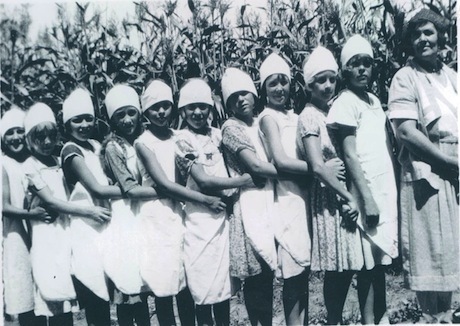 The women pictured here are wearing homemade uniforms. In the early to mid 1900's women were forced to limit the number of dribbles, play half court basketball and were kept from entering the lane on free throw attempts. Society felt that women could not hold up to the physical and emotional pressure of competition. They were also of the opinion that jumping would be harmful to the female reproductive system. 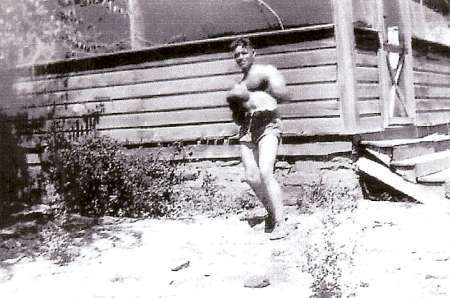 Harvey Palmer, a boxer from Taylor. Foot races were very popular in the early days. 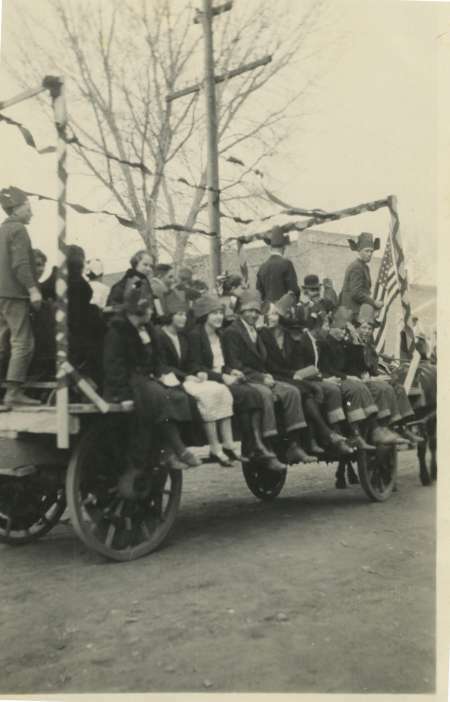 They were held during all the town celebrations, such as 4th of July or Pioneer Days. The races included all ages and both sexes with a variety of novelty races such as wheel barrow, potato and 3 legged race. Jess Pearce and Allen K. Miller were two of the better-known sprinters. Jess Pearce was challenged by track men all over eastern Arizona. 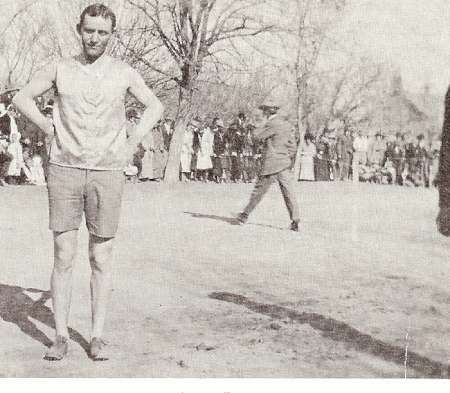 One especially memorable 100-yard race was between Jess and Allie Mineer of Saint Johns held in Snowflake on March 14, 1914. The race was very close with less than a foot between them. Pearce was the winner with a time of 10 2/5 seconds. According to S. Eugene Flake, Pearce would bet on the outcome and his strategy was to just barely keep ahead of his opponent and make the race so close that he would be challenged again. John Henry Solomon was Taylor's first shoemaker. He also made boot last patterns. Lasts are essentially a mold of your foot, and were used to create a custom shoe or boot. Known as Doc Gilbert Webb, he was trained as a chiropractor. Students went to him for physicals. He was a tease, saying to one young man, "Oh my, I don’t think you have a heart." Dr. Neal Haywood was the principal of the grade school but became aware of the medical needs of the community. He took a leave of absence from teaching and went to school to become a doctor. When he graduated he had to return to teaching until the community could accept that he was a doctor and could treat them. He was responsible for contracting the Maternity Home in Snowflake. Men take a rest from their hard work making adobes. 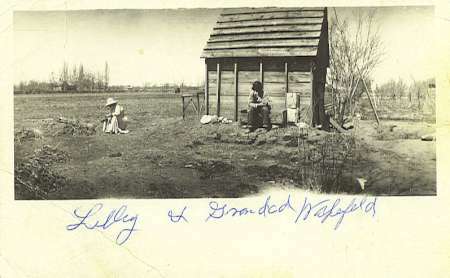 Lilly and Granddad Wakefield working outside on their property. 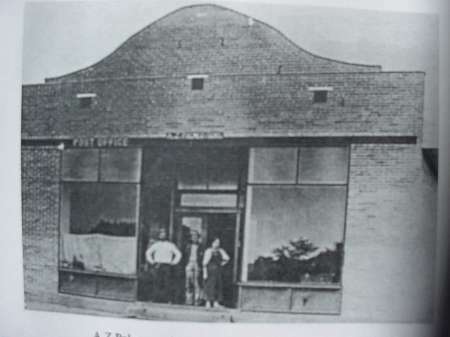 The AZ Palmer General Store. 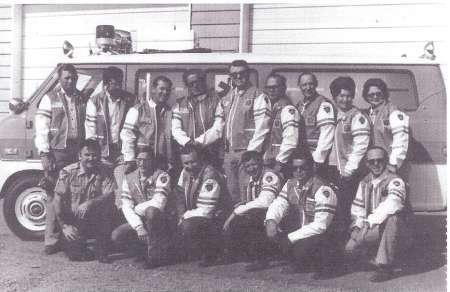 The first ambulance crew in Taylor. The steel bridge in Taylor, Arizona. 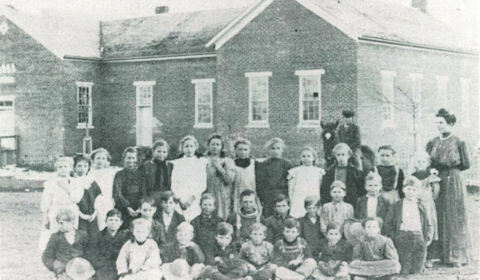 Children and their teachers in front of the old log schoolhouse. 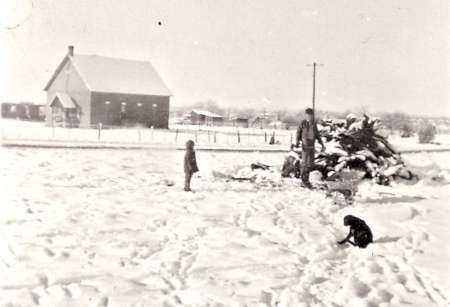 Children in the snow near the old schoolhouse. 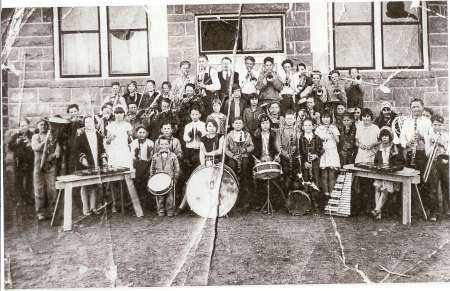 The grade school band posts for a picture. Taylor's city hall after being remodeled. 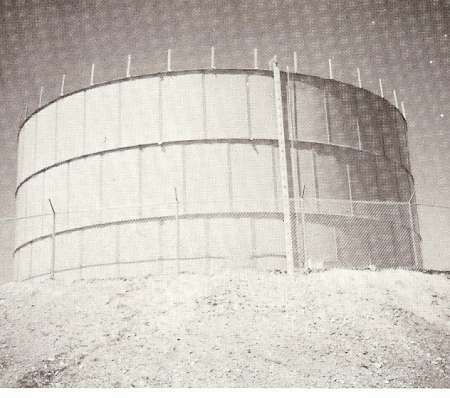 The water tank in Taylor. 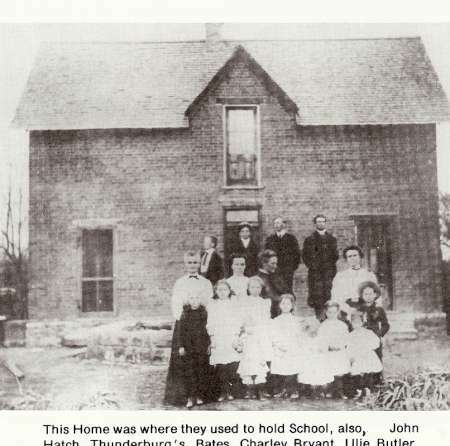 John Henry Standifird and his family were some of the first settlers of Taylor in 1878. 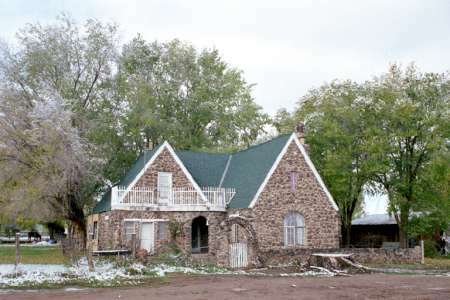 Their home is now listed on the National Register of Historic Places. The home of Jesse Perkins, Senior. The north end is the original building, built in 1879 from hewn logs. Pictured here are Brigham Perkins, Rhoda Perkins Young, Alice Young, and Myrtle Hatch. Jess Pearce and Allie Mineer race. Newspaper records indicate that Jess Pearce won the race. celebrations were foot races. They were held for all ages and both sexes. A couple of the better known sprinters were Allen K. Miller and Jess Pearce. The latter is still talked about as one of the swiftest runners. He challenged or was challenged by track men all over eastern Arizona. Especially remembered was a 100 yd. 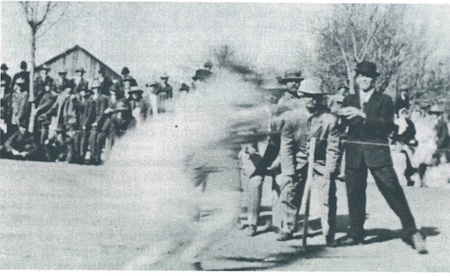 race between him and Allie Mineer of St. Johns held on the Snowflake Main Street March 14, 1914. The race was very close, the distance between the two being less than a foot, Pearce winning with the time taken of 10 2/5 seconds. Friends of both of the runners maintained that this wasn’t the fastest time of either of them.” According to S. Eugene Flake, Pearce would bet on the outcome and his strategy was to just barely keep ahead of his opponent and make the race so close that he would be challenged again. Picture taken in 1890 of Keamey, a race horse with Louis Johnson as jockey and Osmer D. Flake standing at rear. 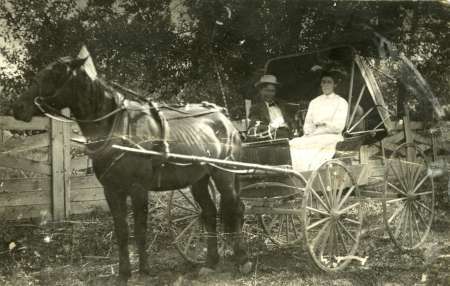 On the porch is Charles L. Flake seated and Belle and Nancy Flake standing. This was the horse that raced against the Willis horse Courtney." prize. There were kid pony races, ladies horse races, cow pony races, work horse races, pony express races, bed races, Indian horse races and so forth. Occasionally there were also races where the spectators or owners gambled on the outcome. named Kearney. A wager was made between O. D. Flake and the Willis’ as to which was the fastest horse. The horses were trained for some time and on the day of the race quite a crowd had gathered. Ultimately the Flake horse, Kearney, won the race. Renz Jennings restored and played the drum for many years. He was a Justice of the Arizona Supreme Court but always took the time and made the effort to participate in his home town of Taylor's 4th of July Celebration. 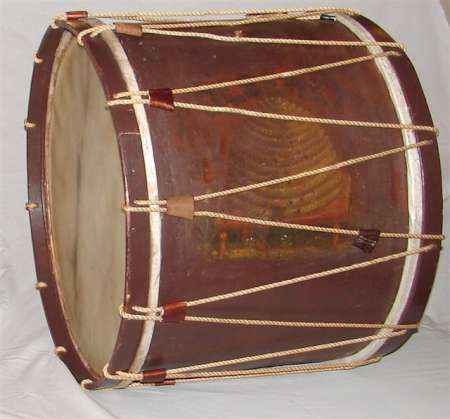 The Jennings Drum was used in 1835 in Far West, Missouri, on to Nauvoo, Illinois then to Utah and Arizona. 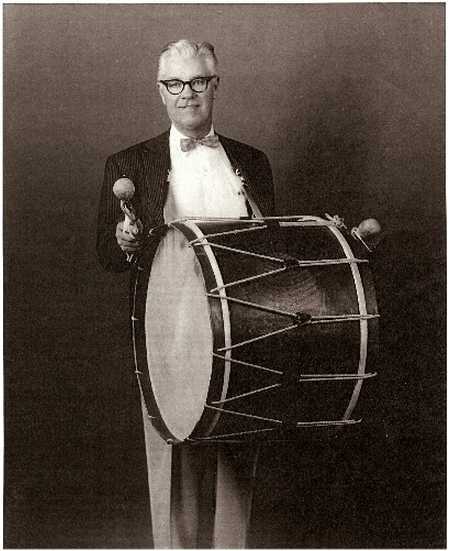 The original drummer was Major Edward P. Duzette and it was played during most community events in Nauvoo. It was often used in military encampments in Utah canyons with the military families accompaniment. It is thought that it was during this time the Beehive decoration was added to the side of the drum. 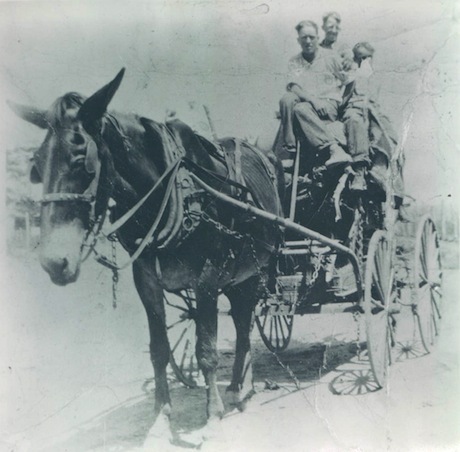 Traveling by wagon, it eventually ended up in Arizona in 1887. Since that time it has been used for important town celebrations. Major Duzette was a dance and music instructor and taught Cyrus Morgan Jennings to play the drum. Cyrus Jennings thrilled the crowds with his earnestness and dexterity playing the drums. To delight and amaze the grownups as well as the children, when a lively tune was struck up he would toss the drumsticks high in the air one at a time and then both together. He could catch them and continue to play without skipping a beat. No matter when he was playing he was cheered and aplauded strirring up fires of patriotism in the hearts of all who heard. The drum is at the Taylor Museum for all to see. The modern day Jennings Band, with conductor Lenn Shumway at the firing of the anvil. You will hear this happening early every morning on holidays. Boyd Hatch is lighting the anvil, which flies high into the air and creates a boom heard throughout Taylor. Two anvils are used. Newspaper is placed over the bottom anvil and a cylinder with black powder is placed over the paper. The second anvil is placed up side down on top of the first anvil with the paper and powder in between. People gather to watch the top anvil launched into the air. The home of Kirk Hatch. Its former occupants include the Wakefield's and Ellsworth's. Pictured here (left to right): Aretha Wakefield, Ellen Bates, Myrtle Hughes, and Letha Bullard. The first addition to the church in Taylor. 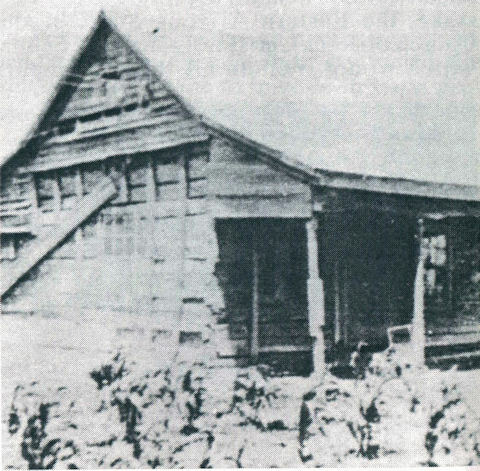 The home where school and church services were held. 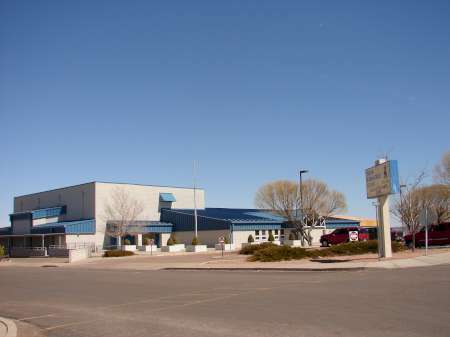 A photograph of Taylor Intermediate School. 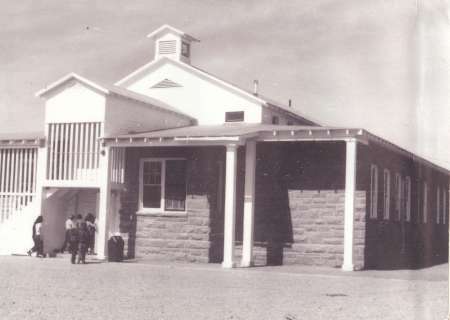 The Junior High School building in 1968. Trapper Days is held on Memorial Day weekend each year in Taylor. 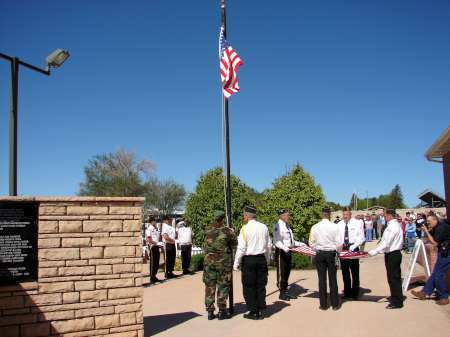 Here, the flag is being raised around the Veteran’s Memorial at the Taylor Museum. A patriotic speech, rousing patriotic music, and a retired flag given to a veteran make this day special. A Memorial Day celebration has been a tradition in Taylor since the first settlers choose to honor their dead with yellow roses that grew wild and were blooming at that time of year. Later they made crepe paper flowers to decorate the graves. In 2002 a Special Events Committee was formed under the direction of Mitch Farr. Brad Click was on the committee. He had been helping Gary and Tom Hatch build the Veteran’s Memorial by the Taylor Museum and thinking about all the sacrifices of these men who had served in the armed forces. After working there during the day he went home as usual and one night had a dream about their sacrifices on our behalf and on waking it was very vivid. The next day he told Gary about it and Gary said, "You better watch out for dreams like that.” He tried to think of a man who was well known who could represent our Veterans. Then he had another dream about Trapper Hatch. After some preparation he arranged to meet with the Town Council to present his plan for a town festival on Memorial Day and call it "Trapper Days." He said he thought it would be good for the Veterans to be able to "cry together." Trapper Days Celebration was initiated in 2002. At the 9 AM program the names of all those who have served from Taylor are read. Usually two patriotic songs are sung, the chosen speaker gives a tribute to veterans, and the flag that has flown over the Veterans Memorial is given to a Veteran. The Sweet Corn Festival is held on Labor Day each year in Taylor. 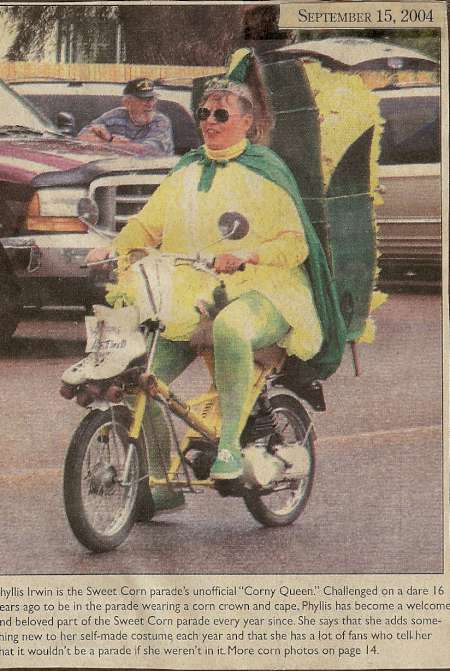 This picture features Phyllis Irvin as an ear of corn in the annual parade. In 1948 Taylor celebrated the Cucumber Festival. Cucumbers were a much needed cash crop as people were still recovering from WWII. This was something the young people could help with. However, the community found other resources over the years and in 1962 the festival was stopped. People used labor day as a day for family picnics and events. In the early 1980s people decided to use the holiday as a way to celebrate the corn harvest. The Sweet Corn Festival brings tourists to town and helps the locals sell their corn crops. The parade starts the festival in the morning and then the town with all its visitors gets to enjoy the horseless rodeo, barbecue, the ranch rodeo, ball tournaments, and arts and craft vendors. The day is a pleasant community celebration to say goodbye to summer and hello to the fall season. Charles Shumway was born in Massachusetts in 1806. In 1832, he married and followed his parents to Galena, Illinois. While there he was able to build a home, a sawmill and clear land for farming. In 1841, a missionary from the Church of Jesus Christ of Latter-day Saints shared the LDS teachings with him and baptized him. He then traveled to Nauvoo and met the church's prophet, Joseph Smith. When he returned home they packed all their belonging onto a raft and floated down the Mississippi River to Nauvoo to work with the settlement constructing the Temple, houses and various other buildings as needed. 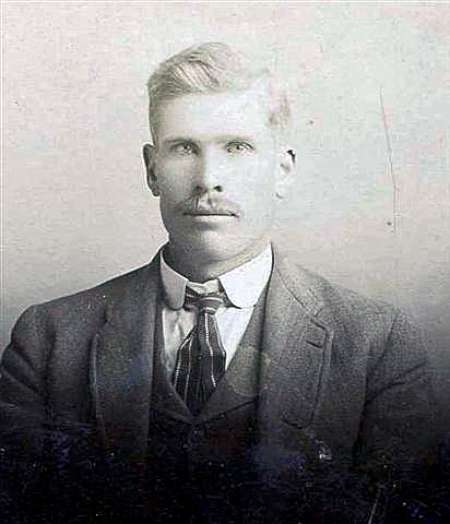 He also worked as a policeman protecting the latter-day saints from mob violence. 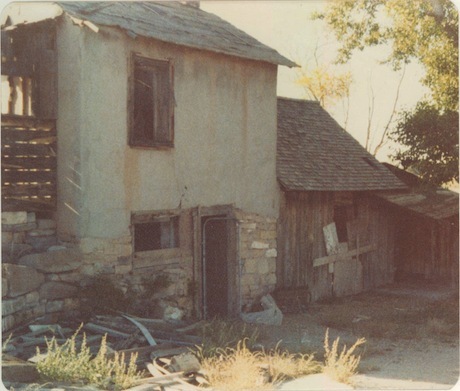 In 1846, Charles and the exiles traveled west to Nebraska and built a settlement of homes, a grist mill and a council house. 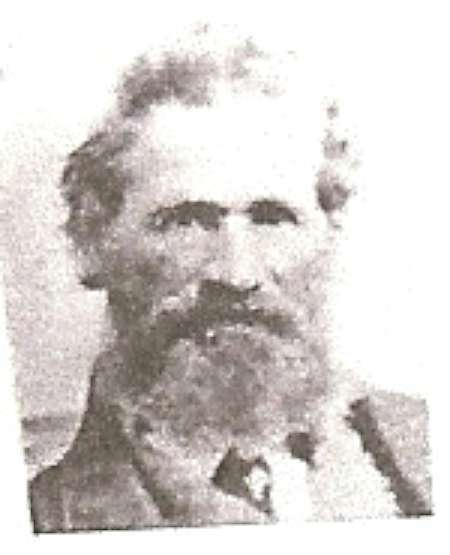 He was selected to be a member of the Brigham Young Pioneer Company and took his son with him to Utah. They worked hard building settlements throughout Utah for Brigham Young Pioneer Company. When he was 75 years old he was asked to go south to settle what is now Shumway, Arizona. There, his older sons helped him build the town that the people named after him. While still married to his first wife, Julie Ann, he married his second wife in 1845, Louisa Minnerly. 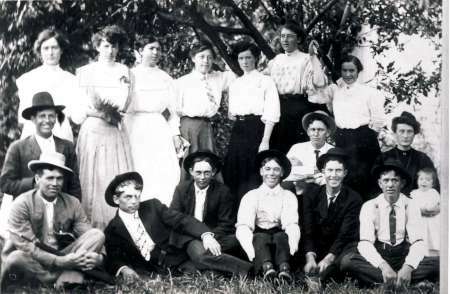 Polygamy was not an uncommon practice in the community at that time. Julie Ann died in 1846. In 1851 Henrietta Bird became his third wife. His forth wife, Adaliza Lauretta Truman married him in 1857, but divorced him after a very brief time. Elizabeth Jardine was his fifth and last wife. 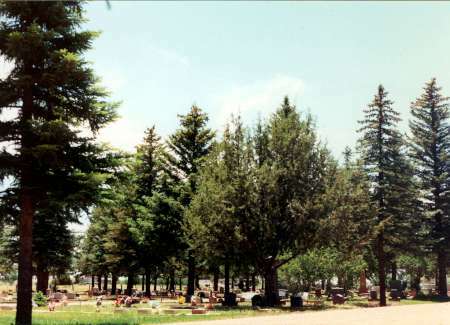 Charles Shumway died in Utah in 1898, but was buried in the Taylor Cemetery in Taylor, Arizona. 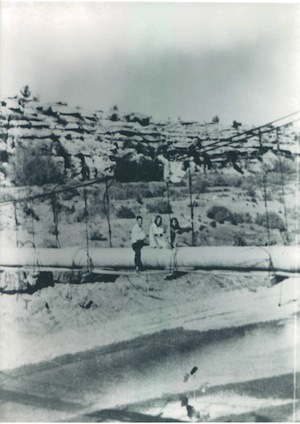 A pipeline to direct the water flow was part of site preparation of the Shumway Grist Mil. Charles Shumway's grown sons helped him build and run it when he was 75 years old. The Grist Mill, built by Charles Shumway, was a real boon to the area. Before it was built the closest place to have wheat ground into flour was Albuquerque, New Mexico. The machinery was brought by railroad to Holbrook and then by wagon to Shumway. Silver Creek had enough water flow to turn the water wheel for power. Carrie Wood was a midwife in Shumway. She was able to use her knowledge of healing herbs that she learned while growing up in the south. She healed many people with the medicinal powers found in herbs. 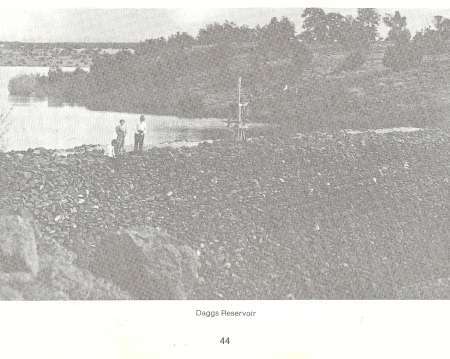 The Daggs Reservoir Dam, pictured here in 1914 at the time of the dedication. The construction was of rock and dirt, which was all hauled by team and wagon. 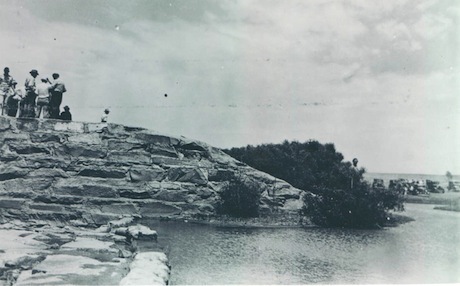 Work on the dam began in 1906 and was completed in 1914 at a cost of $40,000. 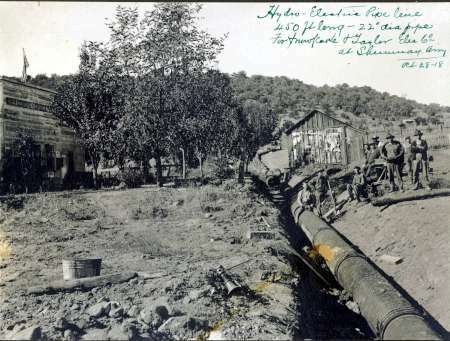 Later, in 1932, the dam needed repairs so the Apache Railway sent out a crew of 20 men to help with the repairs. The Shumway Silver Creek bridge is part of a pastoral setting with green fields and a meandering stream winding its way through the middle of Shumway Valley. Most of the homes are built next to the hills on both sides of the valley. Looking down from the highway shows a peaceful scene with livestock grazing in the pastors. 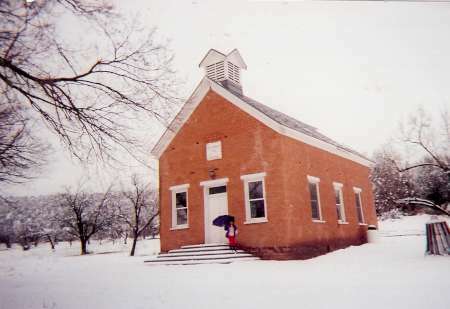 The Shumway schoolhouse was built in 1900 from locally fired soft red brick. It is shaded by cottonwood trees. It was restored during the 1990s. The Butte has always been loved by the people of Woodruff. It is their landmark and their pride. And, with or without the thrilling legends con­nected with it, they feel that nobody has really lived until he has climbed the Woodruff Butte to its summit and viewed the country around it. On the east side of the Butte is a natural amphitheater. In this clear­ing, the Navajo Medicine men are said to have held their "Sing" the night be­fore going up on the butte to gather Jimson Weed for their ceremonies. It is still considered a sacred place by the Navajo Indians. Halfway up the butte are plain evidences of ancient dwellings. There are large circles of rocks, embedded in the ground. 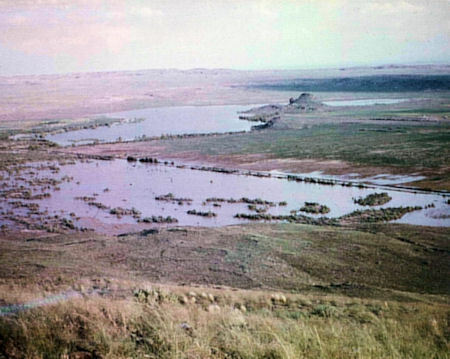 These circles are thought to be the remains of Indian dwellings (hogans) or possibly sheep corrals. 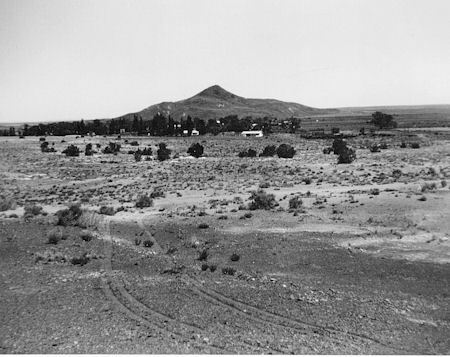 Indians living today in Northern Arizona say the butte was the home of their ancestors. Many flint arrowheads, pieces of pottery and stone axes have been found, as well as corn grinders. 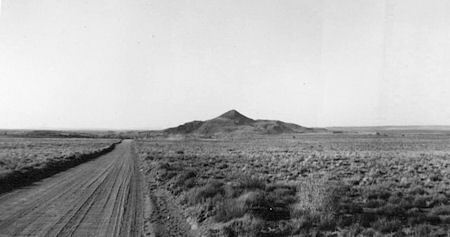 Perhaps the most outstanding and best loved geographical feature claim­ed by Woodruff is the "Butte", "Blue Butte", "Black Mountain", and "The Sen­tinel", as it is called at various times. 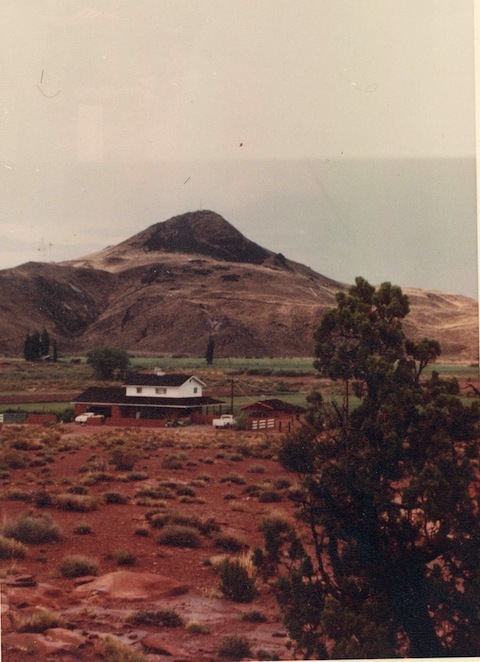 The Butte stands on the north of the community and is of volcanic formation. The elevation is 5616 feet and its peak rises about 500 feet above the town. 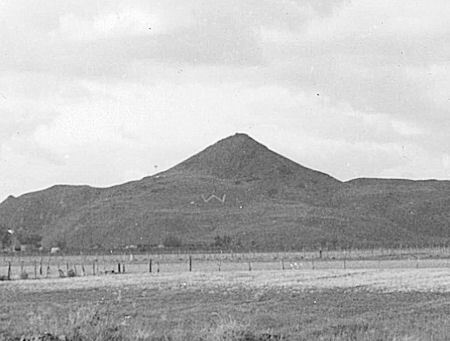 The big W, on the south side of the Butte, was constructed in the 1930's as a project of the Mutual Improvement Association, under the leadership of Floyd Turley and Lois Gardner. Many young folks helped carry rocks to form the letter and then painted it afterwards. On the eastern edge of Woodruff stand the lake and two little buttes. Fishing and some boating (when the young folks could get a boat) were enjoyed in the summer, and the lake made a natural skating rink in the winter. The depth and size of the lake depended on how much water was allowed to run in­to it from the ditches after the thirsty land had been watered. Mostly, it was filled in the winter, after the gardens were matured. This pic­ture shows it after some heavy rains. This photo was taken from halfway up the big butte. I love you in the winter, when you're blanketed in white. And in the foggy weather, when clouds upon your bosom lie. How they lived and fought their battles, how they hunted without fear. To protect this little valley in the day or in the night. I'm sure I'll always love you and my hometown where you stand. Main street about 1900. 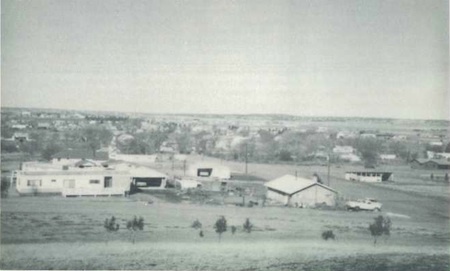 It shows clearly the old ACMI building, trees, and ditches. 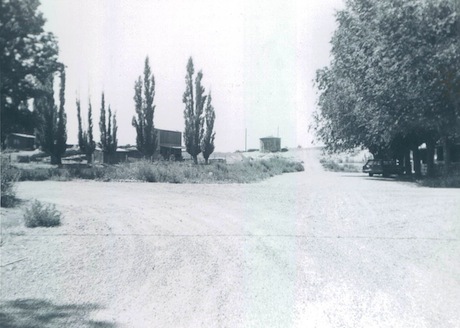 Woodruff's Main Street, looking north toward the butte, about 1930. Outstanding in the memories of the old timers is the solid two-story brick building which was Woodruff's first store. 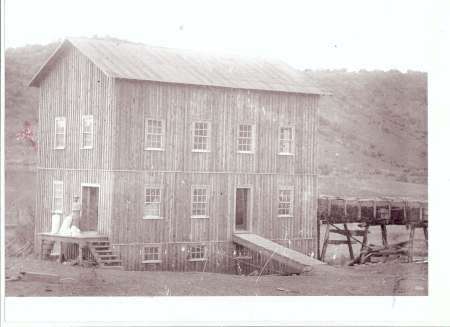 The Arizona Cooperative Mercantile Institution (ACMI) was operated near Holbrook for a few months originally. Then they decided to move the location to Woodruff. On February 16, 1882 a wood­en building was started. The people of the town turned out and in a few days the building was completed. In three years the wooden building was replaced by the brick building pictured here, one of the finest of its size in the Territory at that time. It was a two-story building with a long flight of wooden stairs leading along the outside of the north wall, up to the second story. It had a basement and a hand-operated elevator with which they moved goods out of the basement to the main floor. This was the only place in a young country with bars on its windows, so the basement was used to incarcer­ate prisoners a few times. 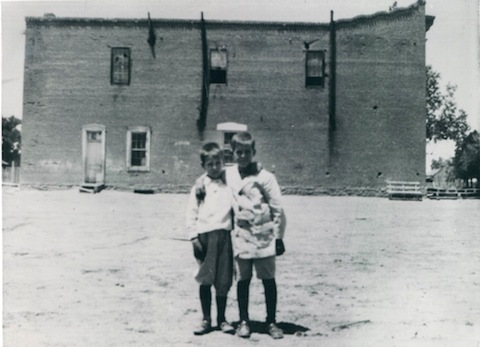 Leo Gardner and Ross Brinkerhoff in front of the old Arizona Cooperative Mercantile Institution (ACMI) building. The ACMI only stayed in Woodruff for about six years. 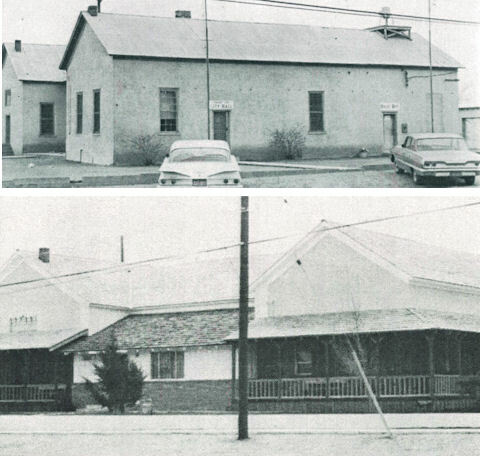 In August of 1888, when the railroad came to Holbrook, the store was moved back to Holbrook and the empty building was purchased by the town of Woodruff. Approaching Woodruff from the south, this picture shows the old dirt highway on the east side of the river. 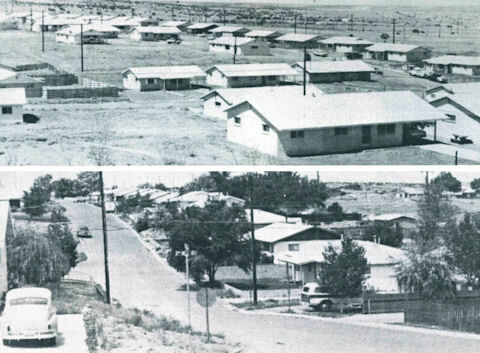 During the first years of its existence, Woodruff was right in the path of progress for the main highway in this part of Arizona went right through the town. This brought tourists, cattlemen, freighters and new colonizers, and many others who had an interest in the country. Everything seemed to point to prosperity for the town. Then, about 1940, the highway was re­routed about 5 miles west, and Woodruff was missed entirely. As you approch the town from the south, the little vil­lage, with its many trees, begins to show up. The low rocky hills surround­ing Woodruff are covered with a typical growth of low bushes such as Sage. Brush, Brigham Tea, Yucca and Prickly Pear. There are willows, tamarisk and cottonwood trees along the river. Wild flowers include delicate white Lil­ies, Buttercups, the tiny Lemon Plant, Indian Paint Brush, Cliff Rose, Coral, Daisies, Larkspur, Poppies, 4 O'Clocks, Jimson and Milk Weed. 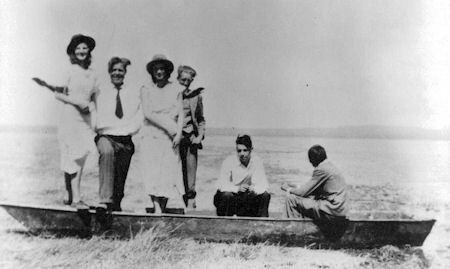 A group of kids boating on the lake east of Woodruff: Ruth Ison, Edgar Turley, Josephine Brink­erhoff, Joe Ison, Phil Gardner, and Lorenzo Hatch. In the wintertime kids enjoyed going skating, but very few could afford real ice skates. Shoes, in those days, had leather soles and they slid fairly well. Sometimes the boys would take kitchen chairs out there and push their girlfriends around in them. They would build a huge bonfire right out on the ice when it was really thick. Then they could thaw out their toes while they rested from their fun. B.P. Savage with his daughter, Ruth Savage. Ruth was miraculously healed from a serious illness when she was about 13 years of age. A doctor from Holbrook pronounced that she would only live for about an hour or so. Her mother sent for a Woodruff man who was known for having the gift of healing. He placed his hands upon her head, closed his eyes, and " he rebuked the destroyer; he promised her that she would get well and have health and strength; that she would study and receive an education and become a teacher; that she would fulfill missions and would hold many responsible positions in the church; that she would be married to a righteous man; that she would become the mother of a large family; and that she would become the mother of a Prophet." Ruth's life was spared, and she was healed and out of bed within days. 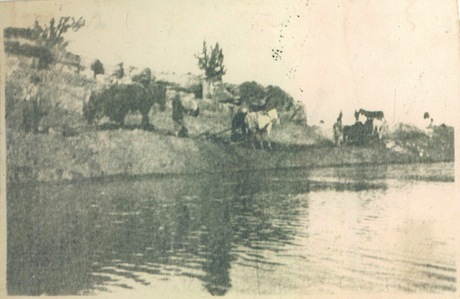 A wagon crosses the river. 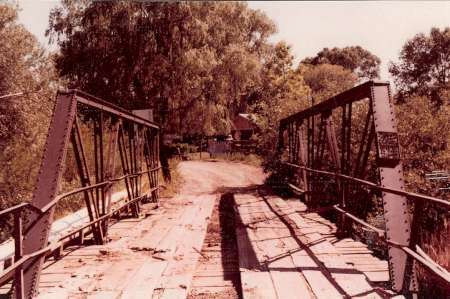 This was prior to bridges being built in the area. 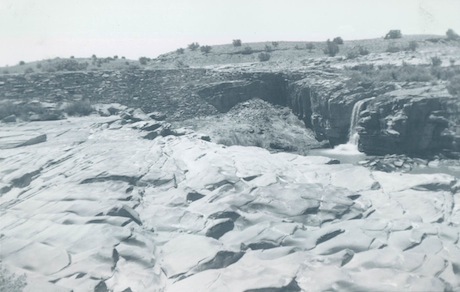 Sometimes when there was a heavy rain, the washes and river would be swollen with flash floods. Folks would have to wait a few hours for the floods to go down before they could continue on across the river. The home of Hans and Ingobor Guldbrandsen. The Guldbransens willed their lot to the LDS Church. 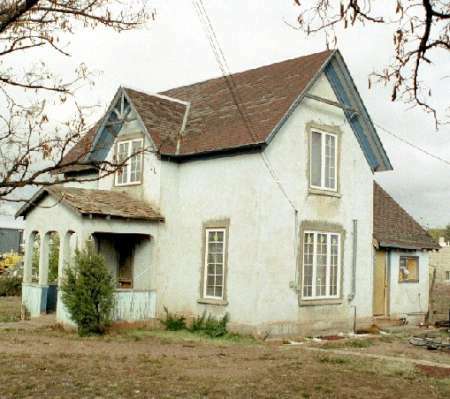 After their death, the home was rented out for many years. It stood where the present chapel now stands. 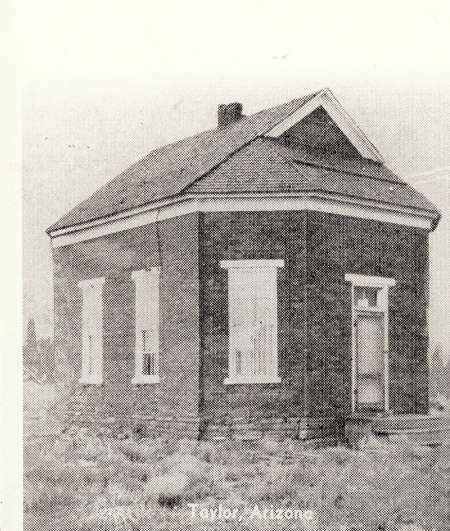 Much later it was converted into a Relief Society meeting house and was used as such until the time it was torn down to make room to build the chapel. This log house belonged to James Smithson. Standing on the porch are Lon Savage and Effie Smithson. 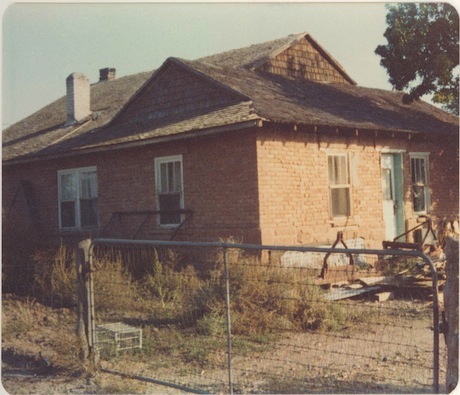 This is one of the few old pioneer homes still standing. James David Smithson came to Woodruff with his wife Elizabeth in 1881. They had 13 children. After Elizabeth died in 1982 he married Julie Savage, a widow with four children. She bore James three additional children. James remained in Woodruff until his death and was affectionately known to the population as "Daddy Smithson." Times were different in Arizona in the 1880's. Most of the men who had teams and wagons made their living at freighting, because everything they couldn't raise in their gardens had to be bought at a Militarty Post, either at Fort Apache or Whiteriver, Arizona. Sometimes they had to go 240 miles to Albuquerque, New Mexico in order to buy flour. What crops they raised here were also used for trading. Cash was very scarce. 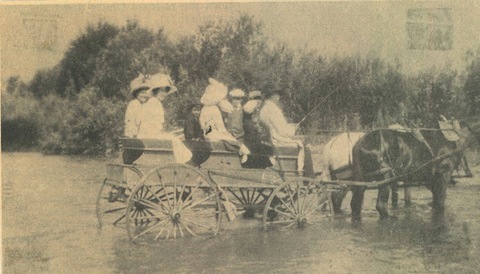 Oxen teams were frequently used. They would be hooked up to two heavily loaded wagons that made an outfit that would measure a hundred yards long. These oxen were great for pulling, but they were very slow in traveling, and it could take as many as two weeks to make a trip to Albu­querque. At that time the grass in the country was plentiful, so there wasn't any need to carry grain to feed the animals in the summertime. While grazing during the night, the cattle would stray far away from camp and as morning came, it would find the men spread out trying to round them up sothat they could be on their way. This was just one of those headaches that a pioneer had to put up with. By the early 1900's times were changing. There were only a few oxen teams doing a little freighting, for by that time, the railroad brought in supplies. 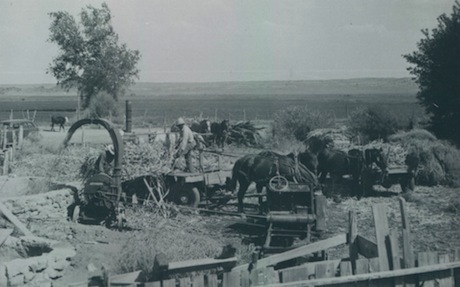 The sheep ranchers continued to ship their wool to Holbrook. 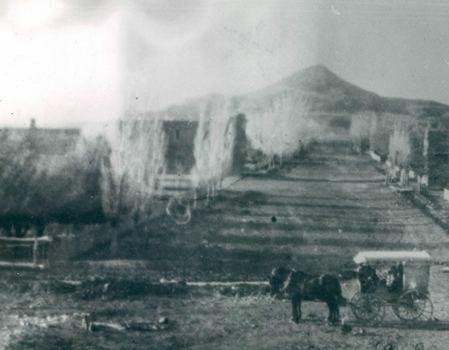 Pictured here is Lehi Heward's oxen team and wagons. His oxen were named Ruff, Red, Nig, Dandy, Tom and Jerry. 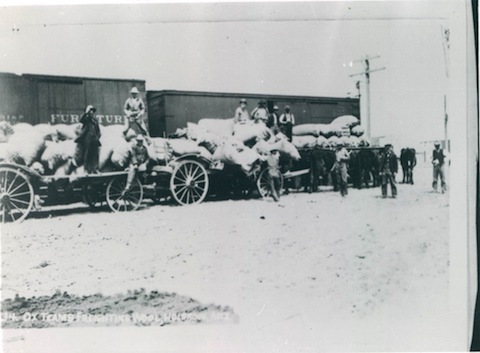 They were unloading wool at the railroad in Holbrook. He primarily hauled wool for a Mr. Candelaria. 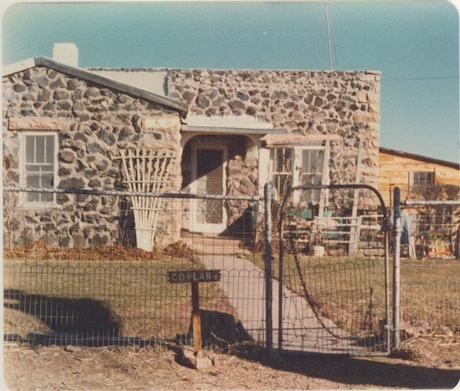 The home of Alma Ruben and Delilah Turley. Later it belonged to Ed and Ann Gentsch. David and Lydia Brinkerhoff's home. Later it belonged to Joe and Phoebe Brinkerhoff, and after that, to Albert and Zine Hatch. The home of James Y. and Anna Lee. Later it belonged to James and Sara Brinkerhoff. 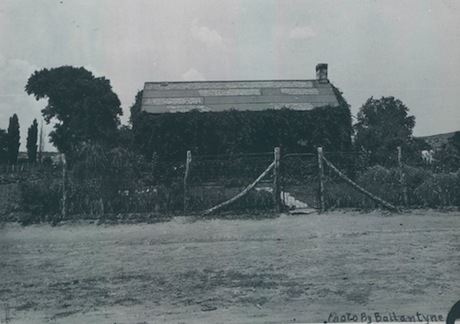 The home of Horace B. and Sally Owens. Later it belonged to Dennis and Lorena Smithson. The home of James Clark and Lucretia Owens. Later it belonged to John Albert and Minnie Bowler. 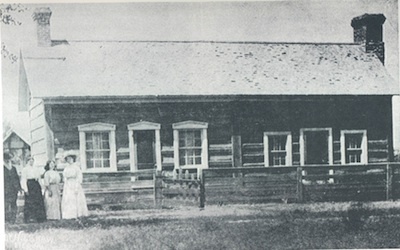 The home of Joseph and Julia Fish. Later it belonged to Wesley and Zelia Turley. The home of Grandma Ella Gibbon, a widow. Later it belonged to Maude Amos. 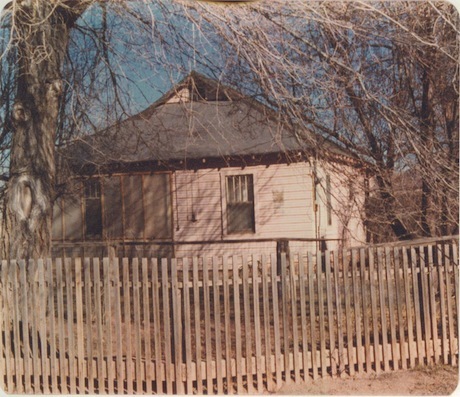 The home of Elmer and Tressa Hatch. Later it belonged to Tony and Willa Johnson. The home of Ed and Hazel Howard. Later it belonged to Nowlin and Leora Kartchner. It is made of native red sandstone. 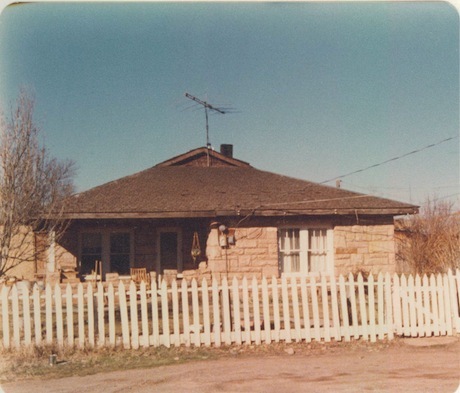 The home of Hyrum and Lottie Turley. Later it belonged to Earl and Lula Coplan. It is made of volcanic rocks from the butte. 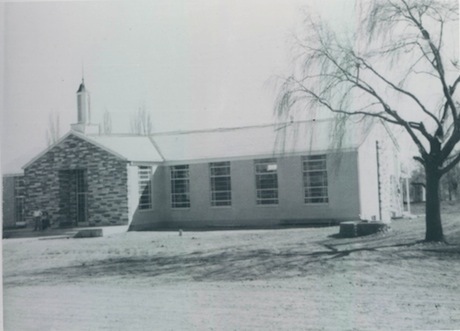 The new LDS chapel in Woodruff, built in 1957. The old church and school bell. 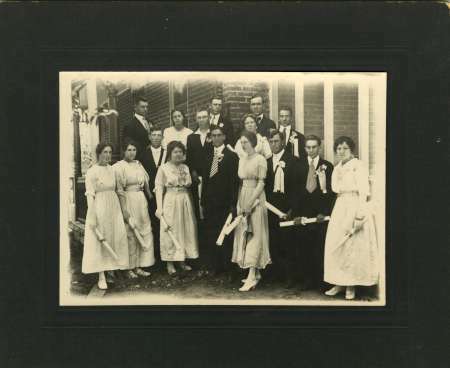 This Sunday school group photograph was taken about 1924. 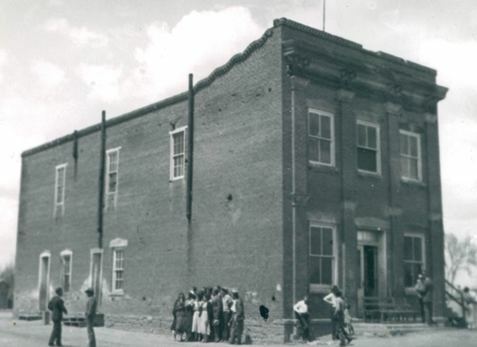 School in Woodruff was first held in a room in the old fort, and later in the ACMI building for many years. 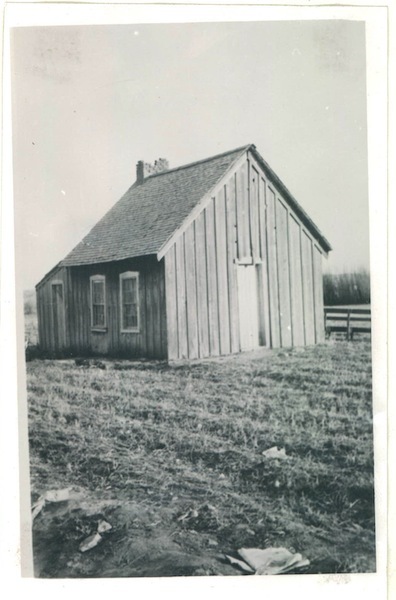 Construction on the first dedicated schoolhouse began in November 1935. 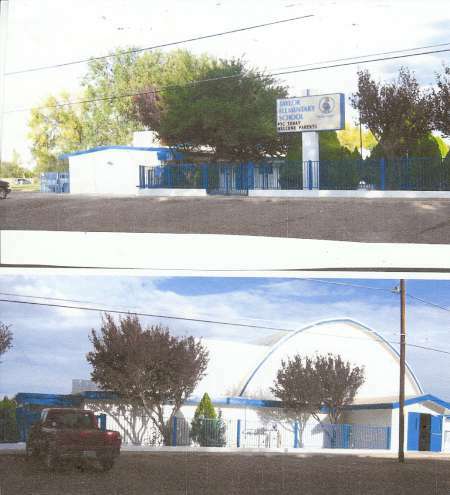 The old historic ACMI building was torn down to make room for a more modern schoolhouse. Most of the bricks from the old building were used to construct the new school. It was completed in February, 1938. 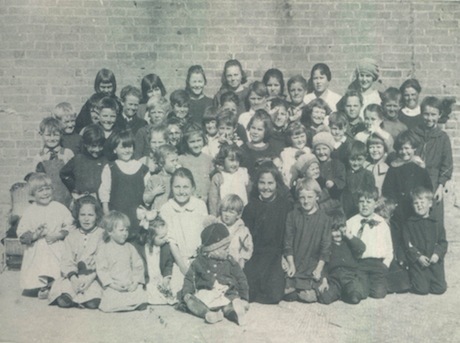 This class photo was taken in 1908 on the north side of the old ACMI building, under the stairs. 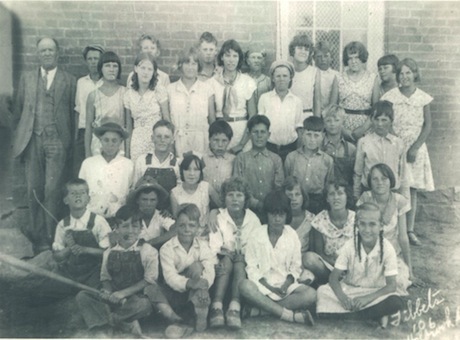 Here is a class picture from 1931. The teacher is James Byron Pace. 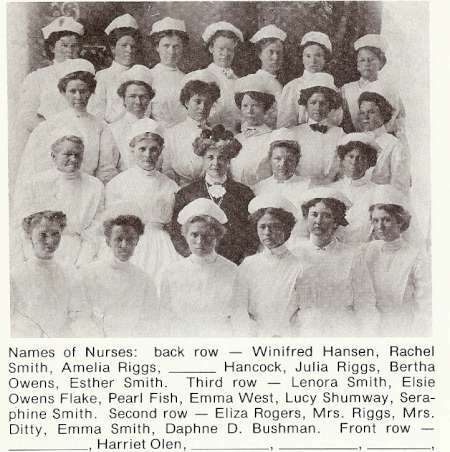 No doctor has ever lived in Woodruff, but practical and trained nurses have been on hand most of the time to care for the sick. 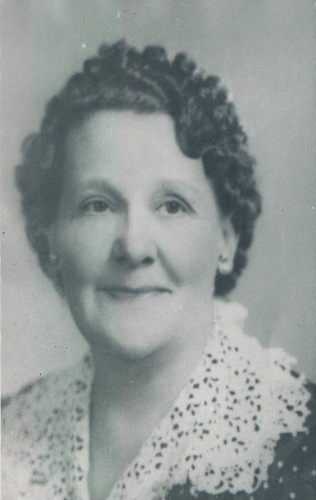 Pictured here is Lovina E. Gardner Larsen. 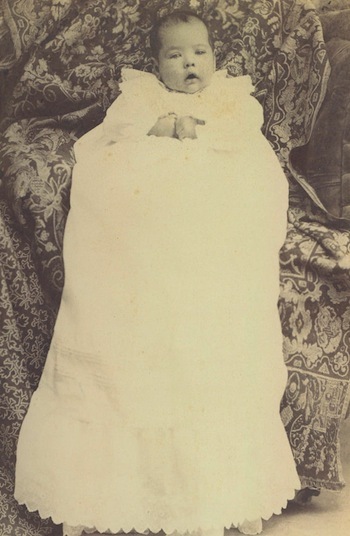 In the early days mothers dressed their babies in long dresses similar to the one pictured. It wasn't until around 1910 that they began using shorter ones. Up until the 1940's or sometimes even later, all babies were dressed in white baby clothes until they were at least three months old. Rex, Ross, and Ralph were the sons of Joe and Phoebe Brinkerhoff. They were baptized on their eight birthday on May 5th, 1927. Ross died that following August. Everyone in town was very proud of their one set of triplets. They were not born in Woodruff but moved there while very young. 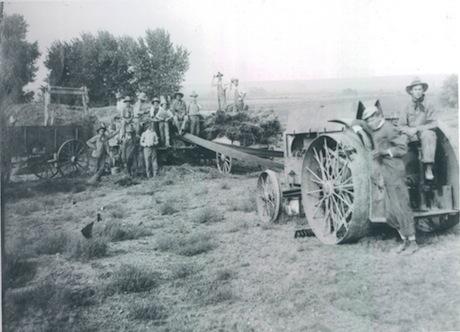 A threshing crew, circa 1920. Woodruff has used wood for fuel for most of its hundred years. Each year the men of the town hauled wood for use in the school and church, for widows, and other families in need of aid. The picture shows a group of men resting from their exertions, about 1932. Teams of horses and scapers working to build a new dam. Farmers used ensilage to feed their livestock. It was made of green corn, stalks and ears together, chpped up fine and put into silos to cure. The cut-up corn would fall right into the solo. Every once in a while it would have to be trapped and leveled. Usually there was enough moisture in the corn to make it cure, but sometimes they had to add a little water to hurry the fermenting process, After it was cured, it would keep all winter and the cows loved it. It tasted something like a pickle. Pictured here are Hyrum Turley cutting and Elmer Gardner helping. was the chicken business. All families had a few chickens, but the main ones to try it out, as a business venture, were James Brinkerhoff, Joe Brinkerhoff, Wallace Turley, John Gardner, Elmer Gardner, Melvin Gardner and Nowlin Kartchner. John Gardner and Nowlin Kartchner were the two biggest. At one time, Nowlin had about 8,000 hens, and he was in the business the longest time, about thirty years. 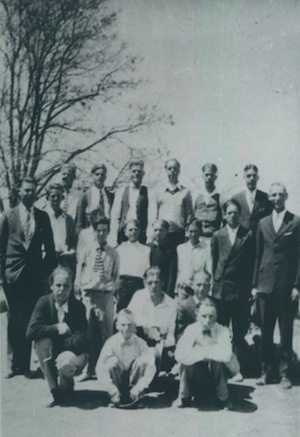 Most of the men joined the Poultry Association in Joseph City. The government put a price support on corn and wheat but not on eggs and chickens, so the price of grain kept going up but egg prices stayed down. Smaller businesses were squeezed out because of it. During the l93O's, the US Government tried to help people during the depression. The Works Project Administration (WPA) did various jobs in each state. In Navajo County they built the rock wall around the courthouse. 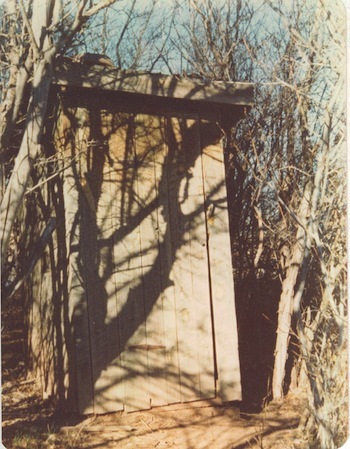 The poor farmers got what the government felt was an improved version of the outdoor "privy" or "outhouse". Most of the people in Woodruff got one. After the project was completed, those little shanties were promptly dubbed "Roosevelt Monuments", and were known as such from then on. The valley was beautiful, the climate mild and the river brought plenty of water to the very doorstep of their town. And yet the problem of getting that water onto the land has been a continual heartbreaking struggle throughout all of Woodruff's history. They built 14 dams. The first ones were made of rocks, brush, and dirt, and washed out almost annually. Q.R. 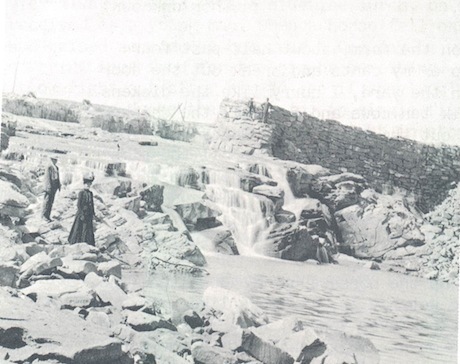 Gardner supervised the building of the 13th dam, and it lasted for ten years. Then once again disaster struck. A phone call came that the Lyman Dam near St. Johns had gone out and a sea of water was rushing down the Little Colorado River. It was night, but people hurriedly packed their belongings into wagons and moved them up onto the hillside south of town. Then they waited and prayed, beseeching God to save their dam and their homes. Early the following morning the great wall of water reached the dam. The first rush of the thick, muddy water overflowed the ditches and rushed into the streets and houses. 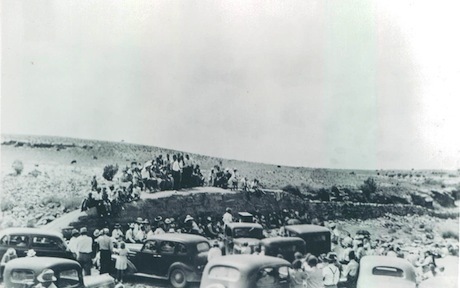 Then it kept rising higher and higher, It reached the top of the dam and to the people standing there. With a thunderous roar, the center of the dam gave way. Huge boulders were carried a quarter of a mile downstream. With heavy hearts the people watched the seething water rusk unhampered down the river where yesterday had stood their beloved dam. water down to the land in town. when the last payment was made twenty years later. The west side of the New Dam. Holes were dug in preparation of the new dam. These two deep holes were below the new dam. The spillway on the west side of the new dam. Much of this canal was built through solid rock and without the methods available to us today. The water had to cross the river several times to find the best route down the river, so several flumes and one syphon were used. that replaced it. The new flume was constructed by the Turley brothers. does not go across the river but hangs along the cliff on one side. The older flume was commonly called "The Ison Flume," because Robert L. Ison was a good carpenter and he had moved into Woodruff just in time to spend a great deal of time working on this flume, which was closest to the new dam. 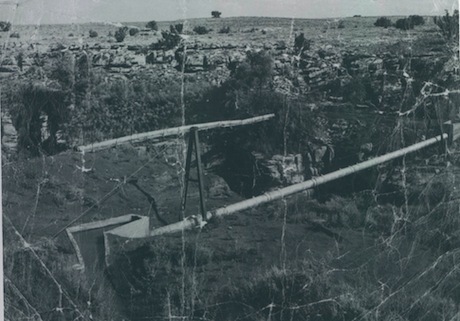 An aerial view of the first flume. 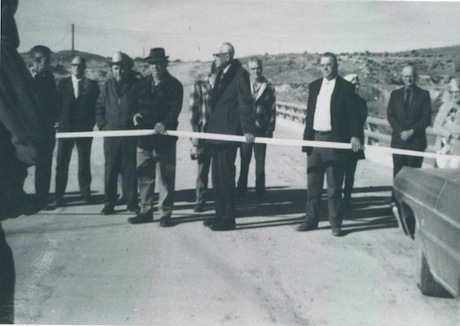 A new bridge was dedicated on January 21st, 1972. This was taken at the ribbon-cutting ceremony. 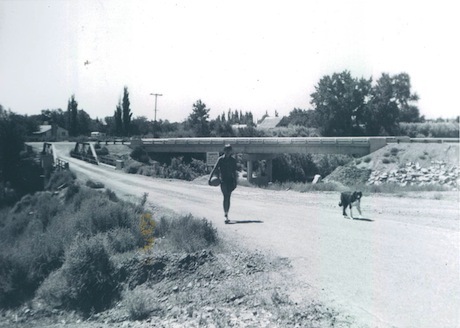 Lonnie Fuller and his dog, Tex, near the new bridge. Through the years, 4-H Club Work has been quite a big thing in Woodruff. Many types of clubs were tried out. The boys went for animal raising, gardens, "Future Farmers of America"; and the girls had sewing, canning, flowers, and so on. There were some great leaders in town.This photo was taken in 1938. 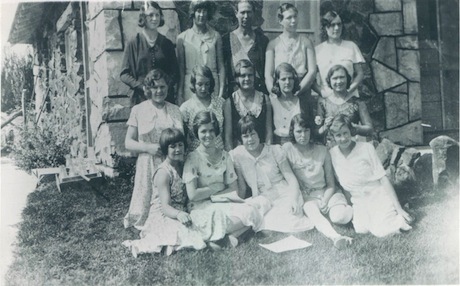 The 4-H garment club in 1932. 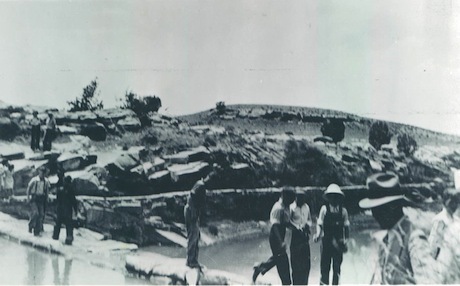 In 1932, the foundation of the small Cannery, which was from native rock, was laid. A cannery is a factory where foods such as fruits and vegetables are canned. The 4-H club had an active canning group, and funds for this new cannery and equipment were raised during a banquet the previous year. 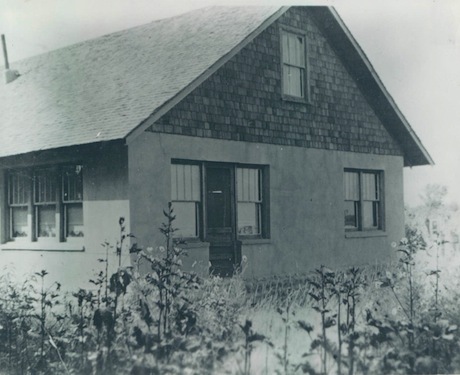 Mrs. Lois H. Gardner, leader of the canning club, wanted to develop a home cannery so that the young people could find employment at home through the growing and canning of foods. A local group of the Boy Scouts first started in Woodruff around 1925. One of the first Scout Masters was a schoolteacher, Leonard Elledge. He was able to arouse enthusiasm in the boys and was a well-liked leader. Around 1928 the Scout Troop hauled wood in a little buggy and sold it in Holbrook to get money to pay their dues and to go on camping trips. Each year the boys would look forward to their pinewood derby and spring camporee. Scouts hauling wood to sell in Holbrook, about 1931. 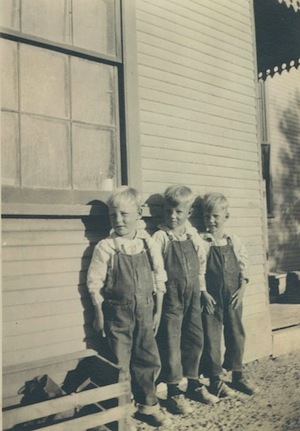 Pictured are Wendell DeWitt, Joe Ison, and an unknown boy. When Gilmore Jackson was Scoutmaster in 1930, he was able to get 100% of the boys of Scout age active in Scout work. When interviewed, he said, "Being a Scoutmaster in Woodruff was one of the great joys of my life. The people of the town really had the spirit of Scouting--doing good turns; anxious to help when something was being done in the Community, like one big family. There is no other place in the world where you get more cooperation than you do in Woodruff!" 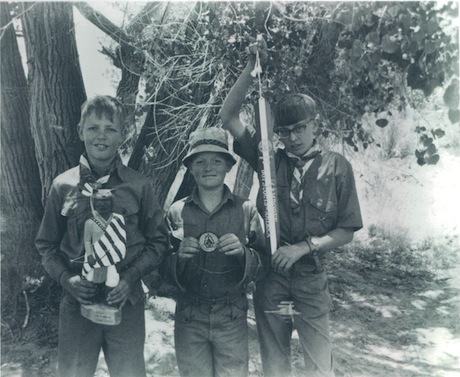 At the Spring Camporee, an annual Boy Scouts outing, in 1973. Woodruff won the trophy for Best Troop. Pictured are Monte Kartchner, Stan Hatch, and Greg Gentsch. In 1926, there were just six wells in Woodruff. 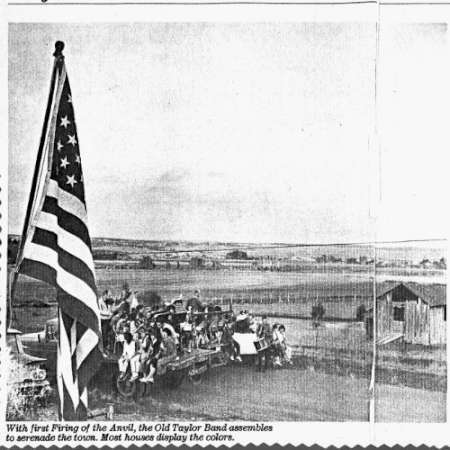 In 1930 the people's dream came true when a town well was drilled at the south end of town. A water tank was put in and a windmill was purchased to supply the power. Soon water was piped into all of the homes. It was a time of great rejoicing: the people of Woodruff now had running water in their homes!